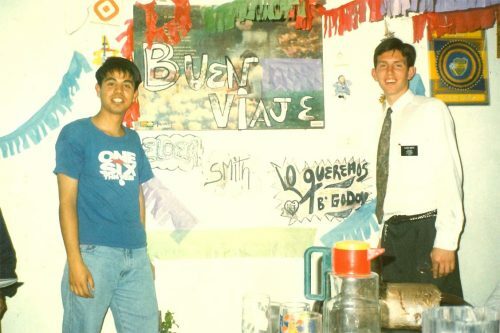 I served in the Arroyito Ward of the Rosario North Stake from August 13 to October 14, 1997. I was only in the Arroyito ward for two months. It was a difficult area to serve in for a variety of reasons, yet I served happily and well during that time. There were not a lot of residential neighborhoods in our area. Rather, we had a lot of shopping and businesses, including some busy streets in this area that had a lot of stores and shoppers. 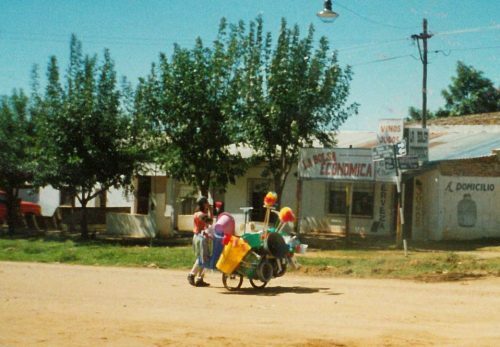 We usually spent a couple hours or more each day walking up and down these busy streets, asking people to talk to us. Percentage wise, very few people would stop and speak with us, but we opened our mouths none-the-less and we had a few conversations every day. Almost everyone who did speak to us, lived outside our area so we wrote down their name and address and sent the referral to the mission home so they could send the missionaries in that area to visit them. 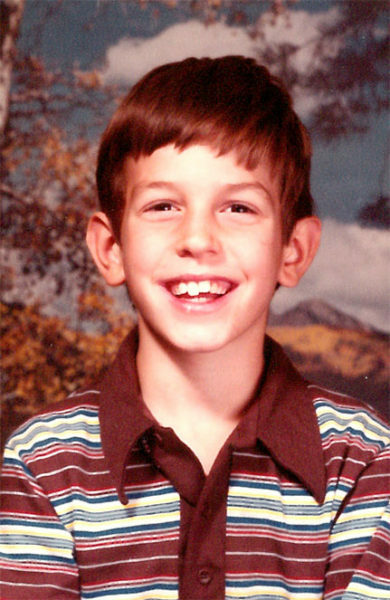 Please note this article is one of a series of posts about my mission. 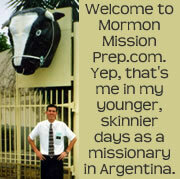 Visit this summary page about my mission to Argentina to see my other mission areas and the conversion stories of people I baptized. I had no baptisms while I was in Arroyito, but the man in this photo on the right, Alberto Gomez, was a recent convert. We were trying to teach the discussions to the rest of his family to get them baptized as well. 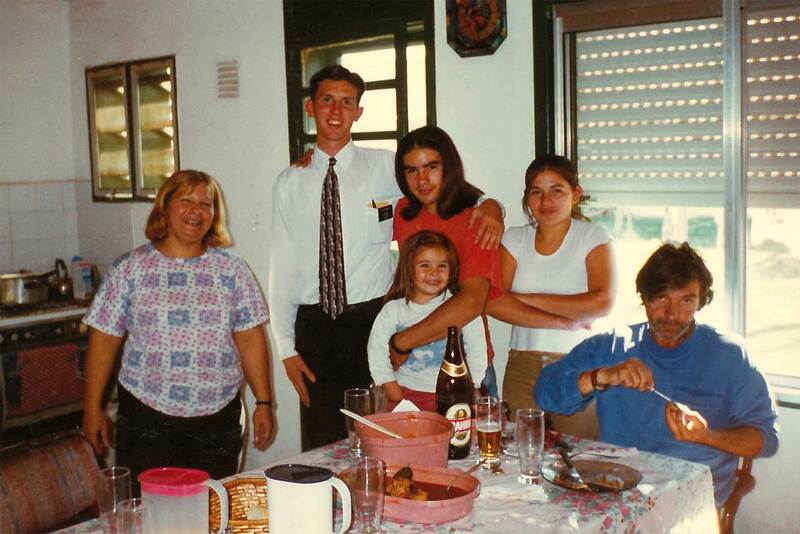 From left to right: Damian, Susana, Romina (a cousin), myself, Carlita, Alberto, Silvia. This is me with a member in the ward named Claudio Rodriguez and my companion, Elder Peterson. 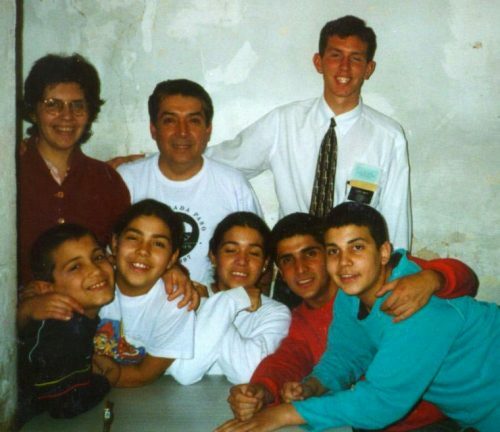 Claudio wanted to join the church for many years as a young man but his family prevented him. 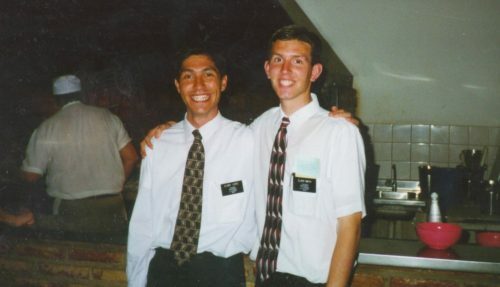 When he turned 18, he investigated the Church, took the missionary discussions, and got baptized. 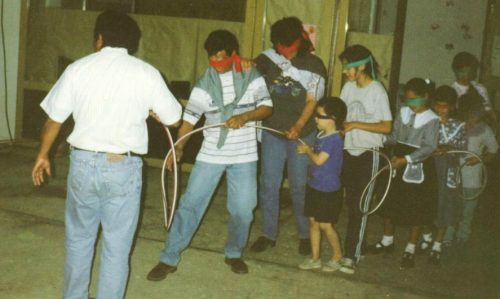 An Arroyito Ward Family home evening activity. This same FHE activity. I think that hose is the iron rod in Lehi’s vision of the tree of life. Sister Tello, her daughter Mariana, and myself. Every Sunday we ate dinner with the Tellos, including Abel, the father of the family who was not a member. This is the Sola family. 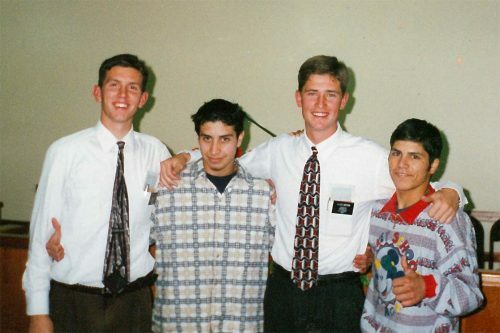 They were baptized about five years prior to this photo. Their youngest, a fourth daughter, is not in the picture. The father of the family is a chemical engineer with Exxon. They lived in a nice home and had a car and I can remember him giving a us rides a few times. They fed us dinner sometimes and once I even remember making them dinner. We had dinner crepes using my family recipe. This is Bishop Ravello and his family. The only names I wrote down are the oldest three kids: Andres, David, and Ruth. 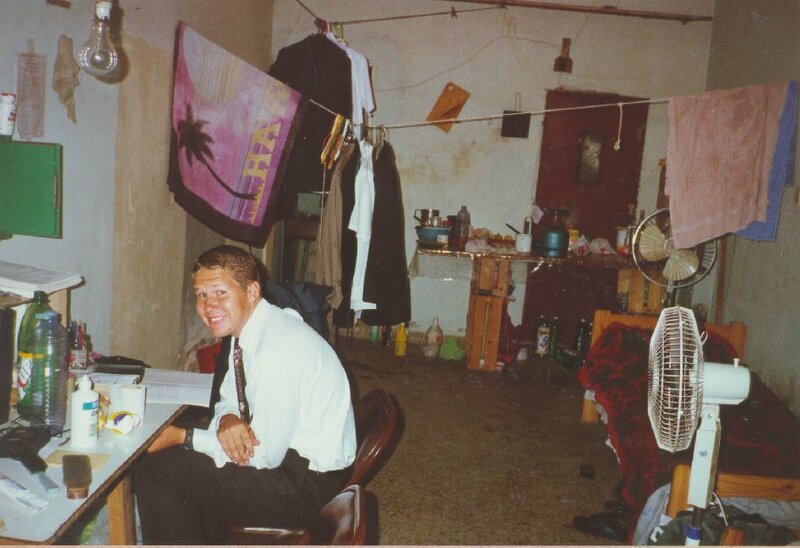 This is my first companion in Arroyito, Elder Peterson, sitting at the study desk in our apartment. 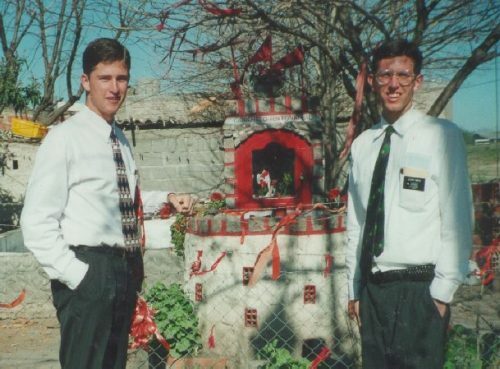 Here is Elder Peterson and I outside the Tello’s house. This is a P-day zone activity where we played American football. 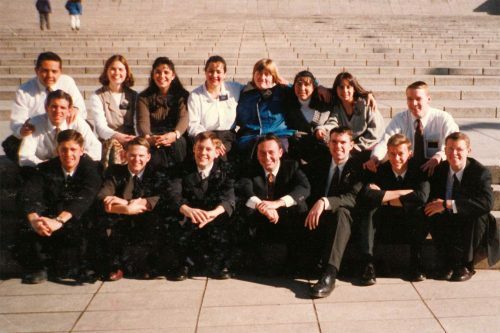 The missionaries are (left to right): Elder Decuster, myself, Elder Wasden (squating), Elder winter, Elder Merritt, Elder Nasal, Elder Jeppson, Eddie Pope, Elder Bray (squatting), Elder Peterson (laying on the ground), Elder Araya, Elder Bell, and Elder Rolon. I think Eddie might have been an American who was playing in the Argentine professional basketball league and some of the missionaries must have met him and started sharing the gospel with him. After a month with Elder Peterson, he was transferred and I had the priveledge of training a brand new missionary, Elder Lopez. Here he is writing to his family on P-day. 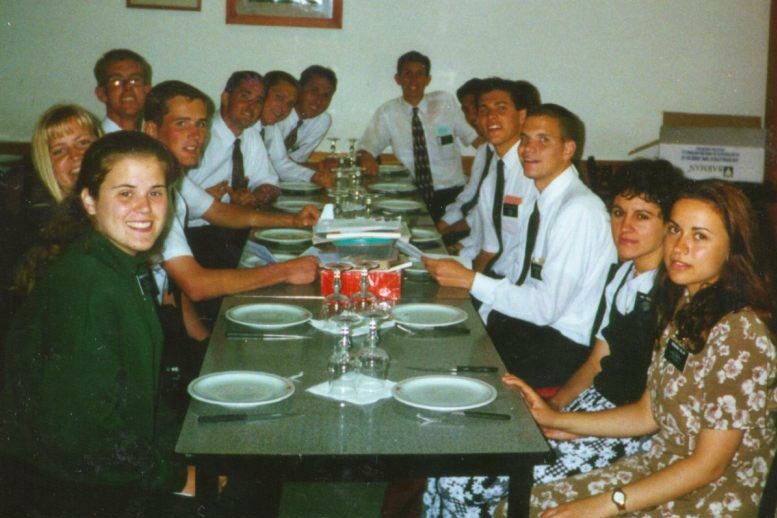 This is Elder Lopez and I at a zone lunch. One of only a time or two that I ate at a restaurant in Argentina. We asked the photographer to get a picture of all the cow parts that were being cooked on the grill. Unfortunately, all we got was the cook’s back. Oh the perils of film cameras. Too bad we didn’t have digital technology back then to know immediately if the picture had turned out. This was the same zone lunch as the picture above. They had an all-you-can-eat buffet for $5. A super deal. This is me in front of the “Vino Toro” (“Bull” brand wine) factory. Argentina is well known for their beef, so I thought it would be cool to get my picture in front of this giant cow’s head. 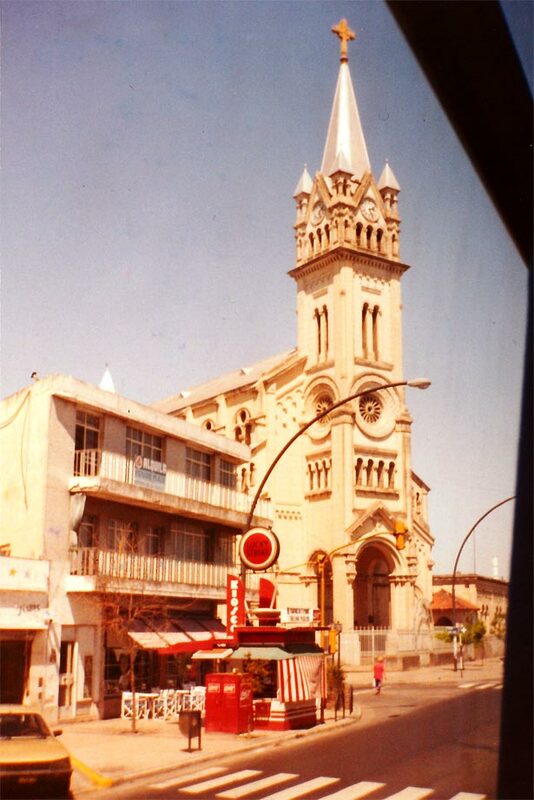 I had seen this Catholic Cathedral from the bus when I served in Beltran. We passed by it whenever we took the bus from Beltran to the mission home for interviews with the mission president. It turns out this church was in my area in Arroyito and we walked by it multiple times each day. 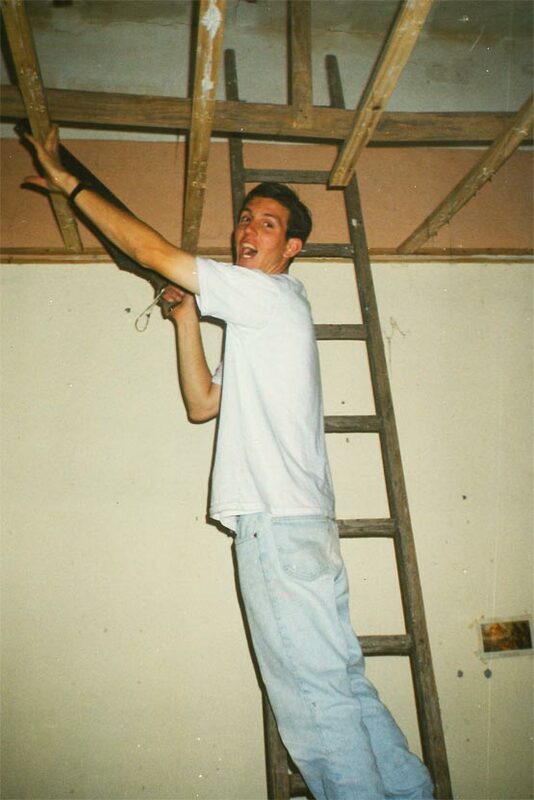 Here I am working on removing the drop down ceiling in our apartment. The plaster ceiling tiles had been falling and it was presenting a hazard. We talked to the land lord and got permission to remove all the tiles and the wood structure holding them up. It was our service project for the week. Elder Lopez snapped this picture of me with a huge smile on my face. I’m not sure why I was so happy. As you can see, we were just coming into our apartment after getting caught in a rain storm. I guess when you’re in the service of the Lord, he blesses you with great joy inspite of afflictions you might face. This was on my last day in the Arroyito area. I only had a month left in my mission and I assumed I would be staying in Arroyito for that month, but I suppose the Lord had other plans. I was transferred to the Saladillo ward and made a zone leader for my last month of my mission. 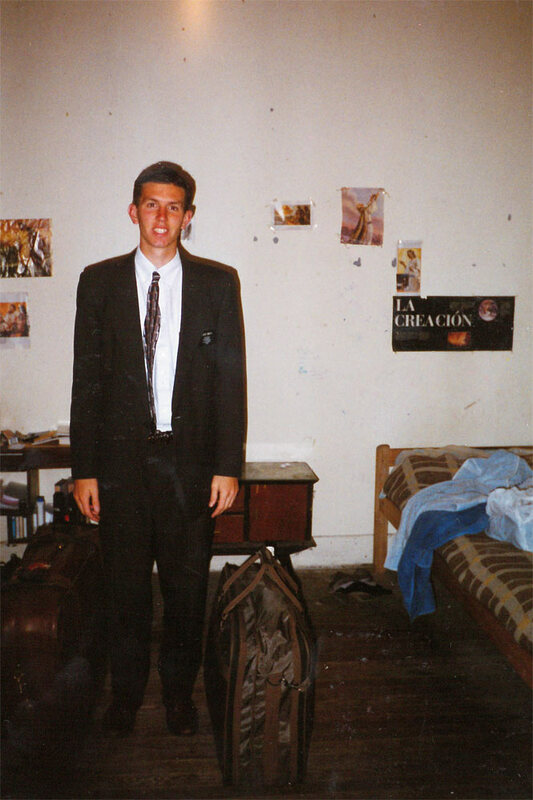 I served in the Godoy Ward in the Rosario West Stake from April 23 to August 12, 1997. Rosario was the biggest city in my mission area and the location of the mission home (where the mission president lives) and the Rosario West was one of three stakes in the city. 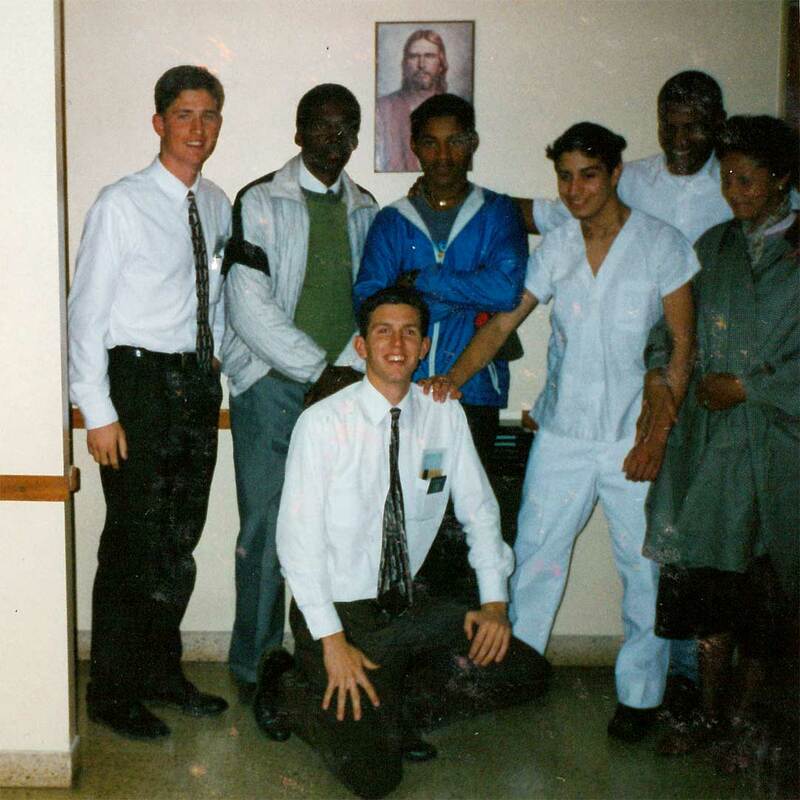 This was the sixth area/ward that I served in during my mission. 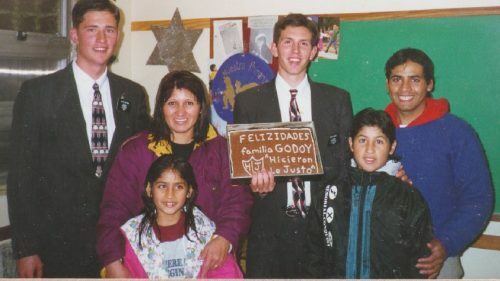 The Godoy Ward was memorable because it was an area where I had more success in terms of baptisms than just about any other area on my mission. 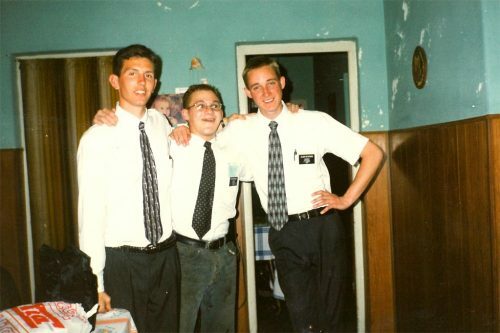 I also have great memories of the ward members and my mission companions there. 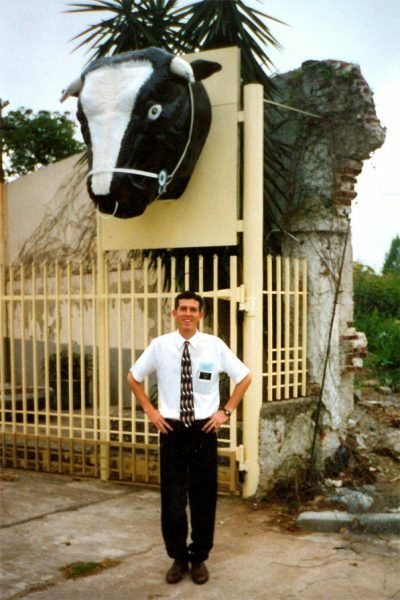 Also please visit this summary page about my mission to Argentina which includes the conversion stories of people I baptized and a summary report of each of the areas or wards in which I served. 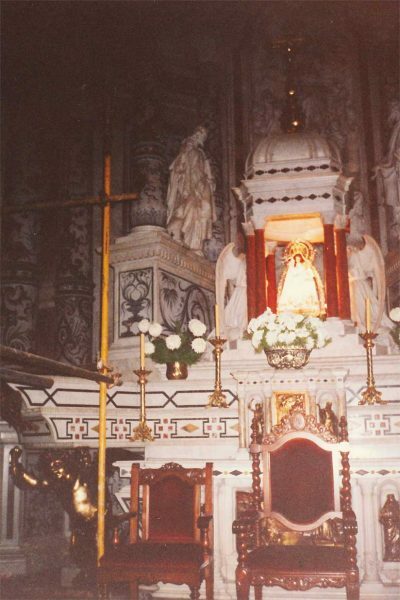 This is the baptism of Maria Ines Theodoroy on May 4, 1997. 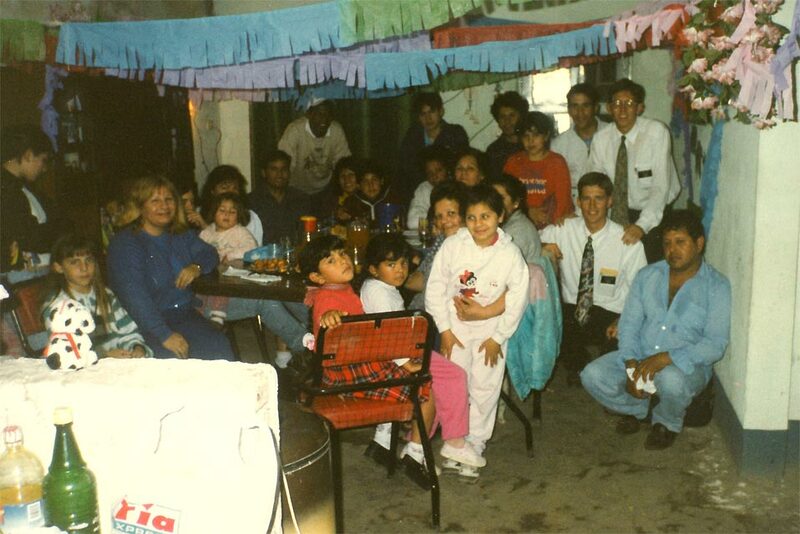 The baptism was performed in a above ground swimming pool that the Godoy Ward put on the roof of the building they were renting for Church meetings. 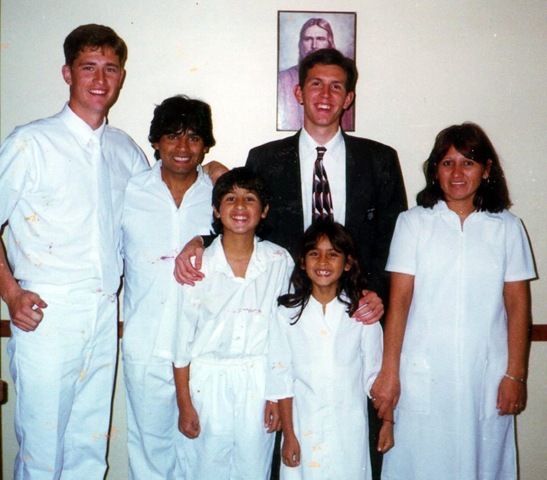 As I recall, many in her family had been baptized into The Church of Jesus Christ of Latter-day Saints the month prior, before I arrived in the area. Around the time I arrived, she decided she wanted to get baptized, so we taught her the discussions. This was a memorable baptism for me because I remember that it was a cool fall evening and stepping into the pool was uncomfortably cold. I went into the font first, and when Maria Ines stepped into the water, I remember a warm feeling coming over me, not just spiritual in nature, but it felt like the water got physically warmer. 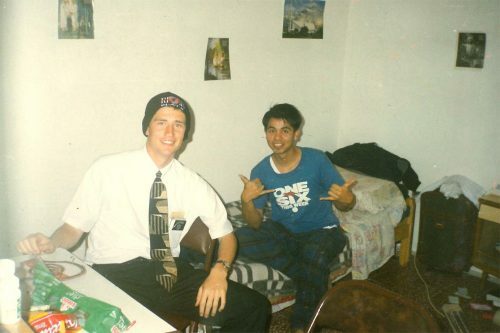 I took it as a sign from God that he was pleased with me as a missionary. I don’t recall if I asked Maria Ines if she felt the same thing or not. I think God was also pleased with her decision to follow Jesus Christ into the waters of baptism. May 11, 1997. The woman on the far left was named Stella. 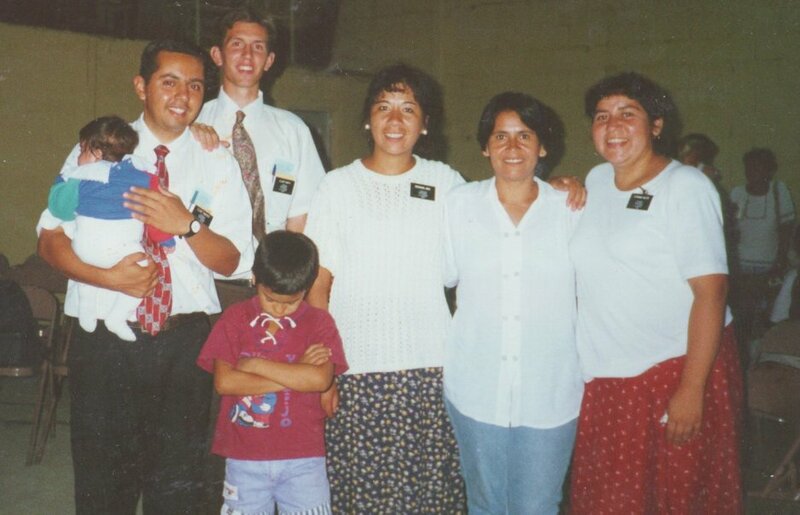 She and three of her children were baptized that night after being taught by the other elders in the ward. 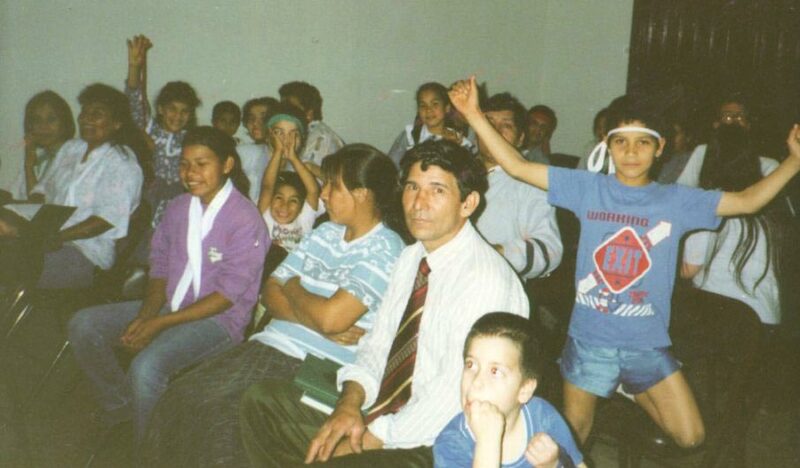 My companion, Elder Loertscher, and I taught the boy in the front right named Cristian. 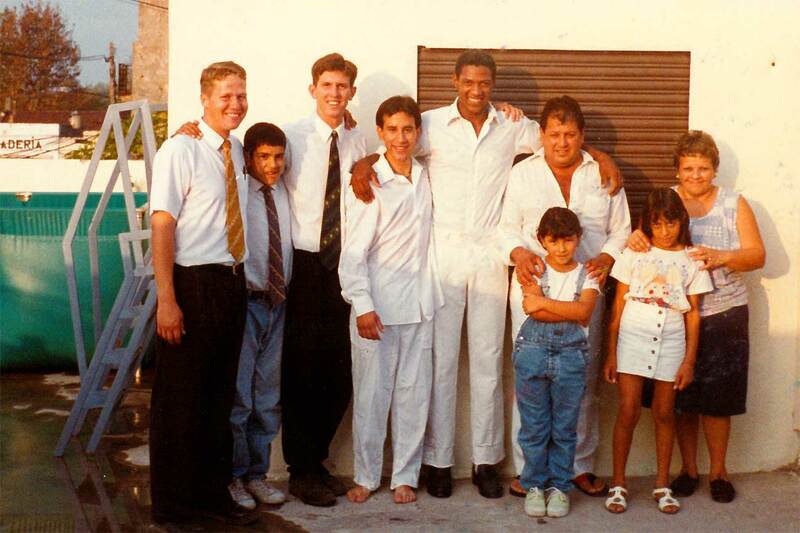 His uncle, Walter Pizarro behind Cristian and to the left, is a member of the ward and performed the baptisms. May 18, 1997. This is the baptism of a man named German Arrieta and a young man named Sergio Arrieta (no relation). 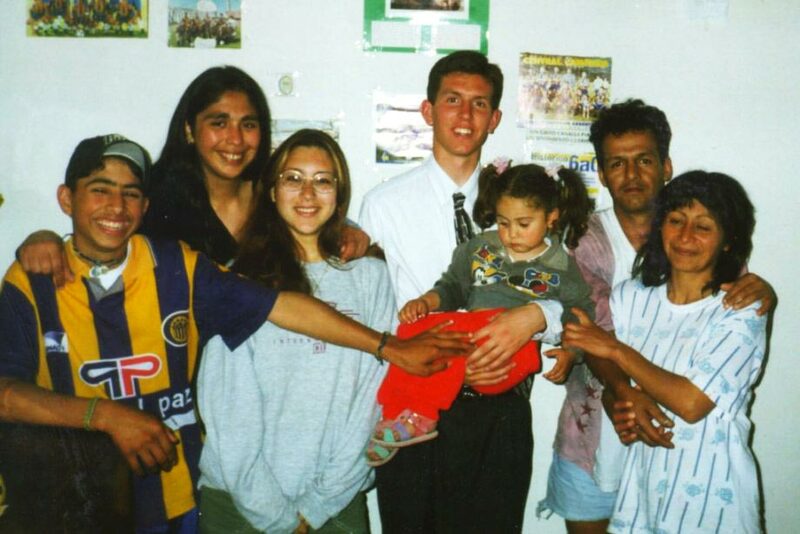 From left to right, Elder Loertscher, unknown boy, myself, Sergio Arrieta, Hedgars Gonzalez who is Sergio’s friend, German Arrieta, his daughter Evelin, German’s wife Sara, and their niece. 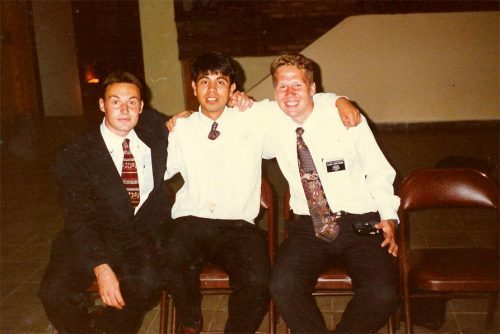 I’ve previously written about the conversion of German and his faith and testimony. Hedgars, I believe, was the ward missionary at about 19 or 20 years old here, and he was a great member-missionary. I believe he later went on a full-time mission. Sergio was Hedgars’ friend to whom he introduced the restored gospel of Jesus Christ. Here’s another photo of the Arrieta family. Back row: Me, German, and Sara. Front row: Evelin (8 year old daughter), Alba (a friend), and Ivana (a younger daughter, I think). June 15, 1997. A friend of the Gonzalez family named Jose was baptized on this day. Jose is a good friend of Noe, the one in blue behind me. Hedgars performed the baptism. 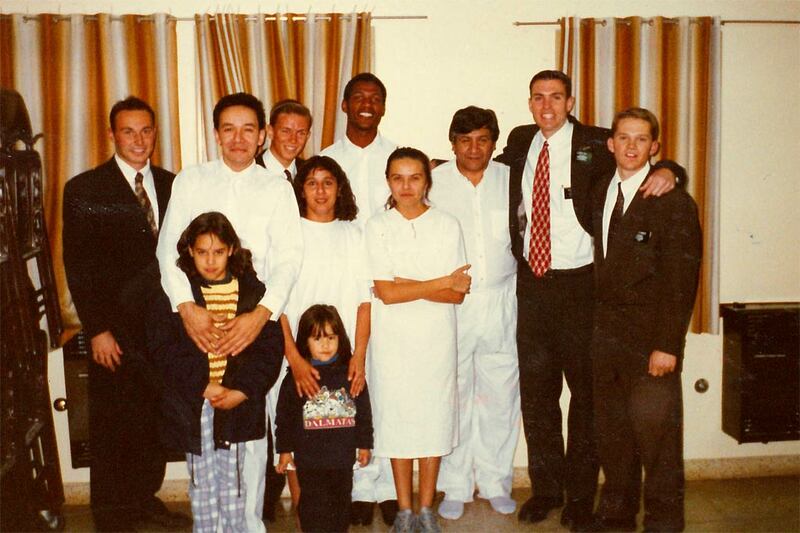 From left to right: Elder Brown, Brother Gonzalez, myself, Noe, Jose, Hedgars, Sister Gonzalez. 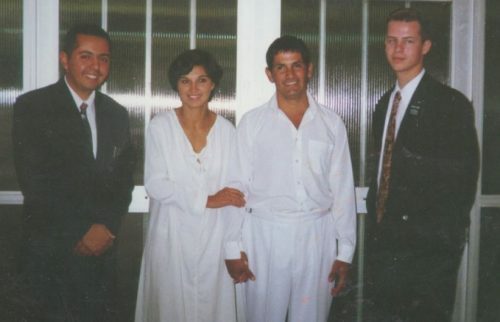 Also on June 15, 1997, Javier Benitez, a relatively new member himself, baptized a friend of his from work, Oscar Sosa. 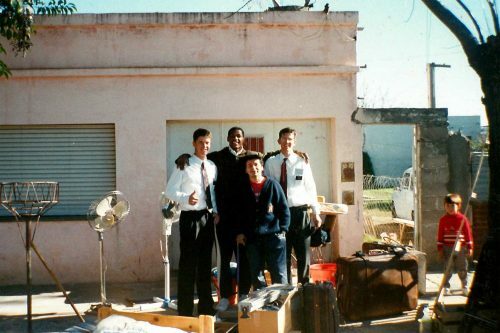 From left to right: myself, Javier, Oscar, Elder Brown. 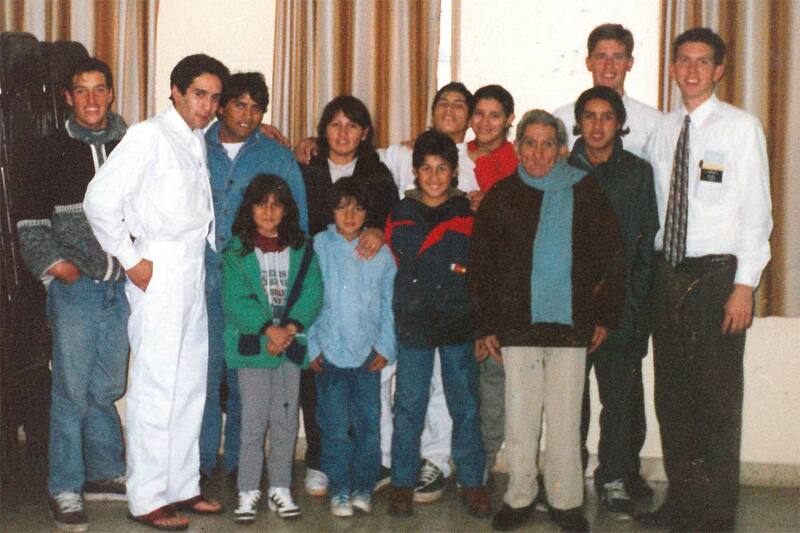 Here’s another photo of the baptism of Oscar Sosa. His grandfather, girlfriend, and other friends came to the baptism. Also in the picture is Carlos Godoy, Oscar’s uncle, and the rest of the Godoy family. Myself, Jose, Elder Brown, and Oscar after the baptismal service. July 13, 1997. This was a great day. 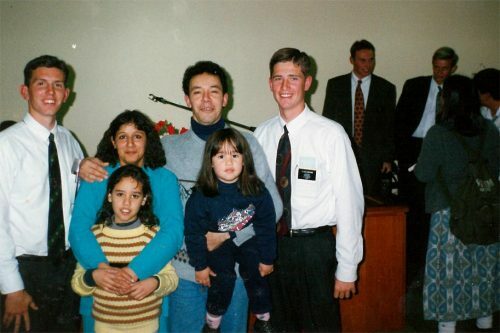 The Godoy family was baptized and took a step towards become an eternal family. 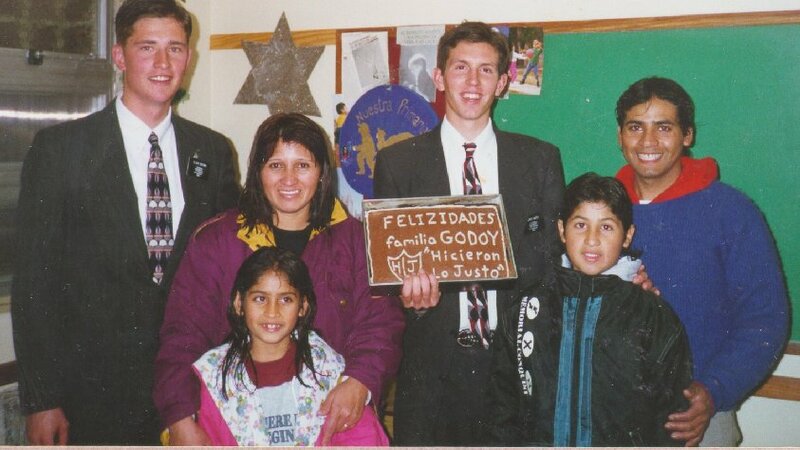 I have previously written about the conversion of the Godoy family. It was miraculous and it was a joy to teach them the gospel and see them make the sacred baptismal covenants. From the left: Elder Brown, Carlos Godoy, his son Carlos, myself, their daughter Angelica, and Beatriz Godoy. Here is Elder Brown and myself after the baptism of the Godoy family. I’m a little embarrassed by this now, but made them a cake and decorated it with the words “Congratulations Godoy Family. They have chosen the right.” With a crude drawing of the CTR shield in Spanish. 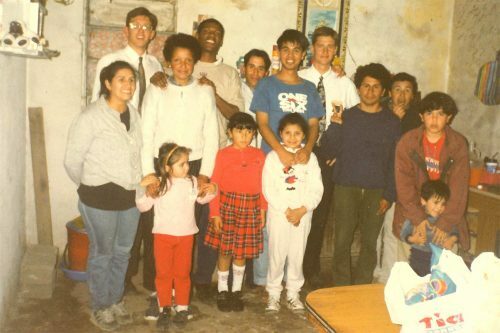 This picture was taken a few days before the baptism. The Godoys had been together for many years, but like many in Argentina, they weren’t actually married. They said they always intended to do it, so when we told them they had to get married in order to get baptized, they made arrangements right away. My companion and I were able to attend the civil wedding. The Godoys had a party that night with family and friends but we weren’t able to go to that. And here is one final picture of the Godoys. 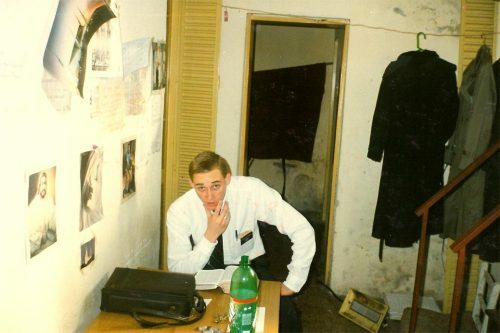 This one was taken at the home of German Arrieta during the going away party that the ward threw for me when we found out I was being transferred out of the ward. Left to right: Beatriz Godoy, Carlos Godoy (with the hair cut I gave him), Carlito, myself, and Angelica (who truly was an angel). This is some of the Theodoroy family. Most of this family had joined the Church in the months prior to me arriving in the area. 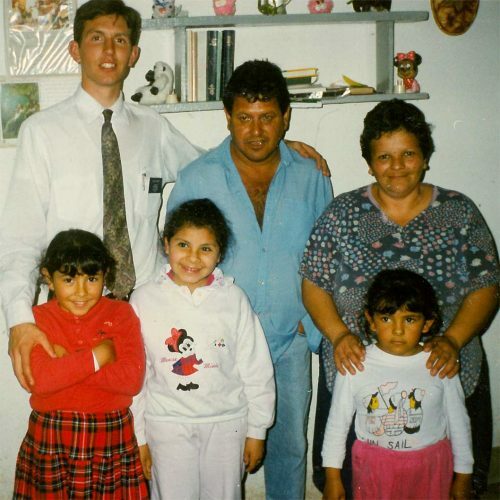 From left to right: Sister Theodoroy, myself, Matias (age 15), Dafne (age 3), Sandra, and the father, Alejandro, who had not yet joined the church at this time. This was a ward family night. 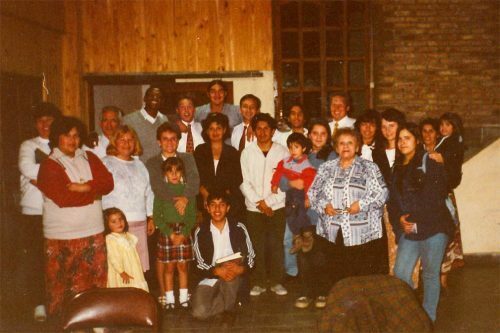 From left to right, the names I remember are: Hilda, Stella, Brother Zapato, Sister Theodoroy, Dafne, Hedgar, Sister Romero, Athenas Theodoroy, Elder Bray, Matias, Unknown Sister, Jorge, Elder Araya, Carlos Pizarro, Sergio, unknown little boy, young sister Romero, Elder Loertscher, unknown sister, young sister Marquez, Sister Zapato, Maria Ines, Sister Marquez and her daughter. The Theodoroy family fed us lunch about once a week and we were very grateful for that. It was always very delicious and they were great to visit with. Back row: Maria Ines, Sister Theodoroy, Sandra. Front row: Athenas (age 8), Dafne (age 3), myself, and Matias. This was the baptism of Jorge and Sandra Roma. 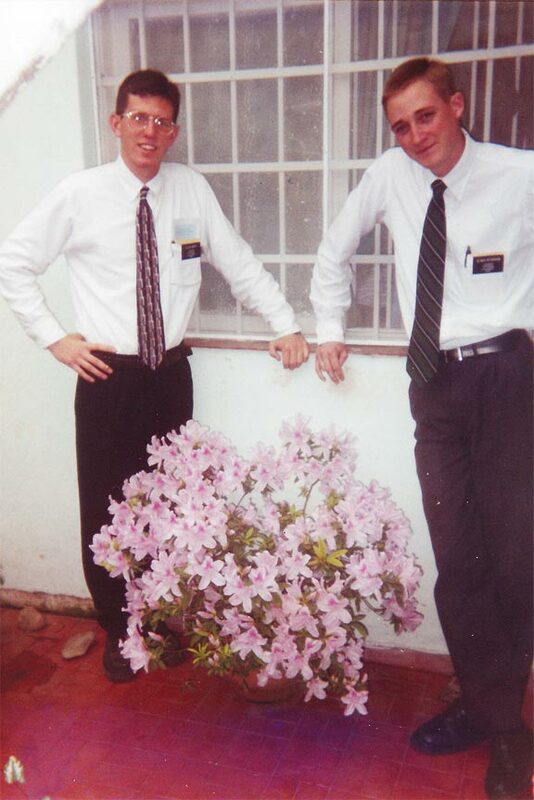 They were taught by the other Elders in our ward, Elder Bray and Elder Redd. 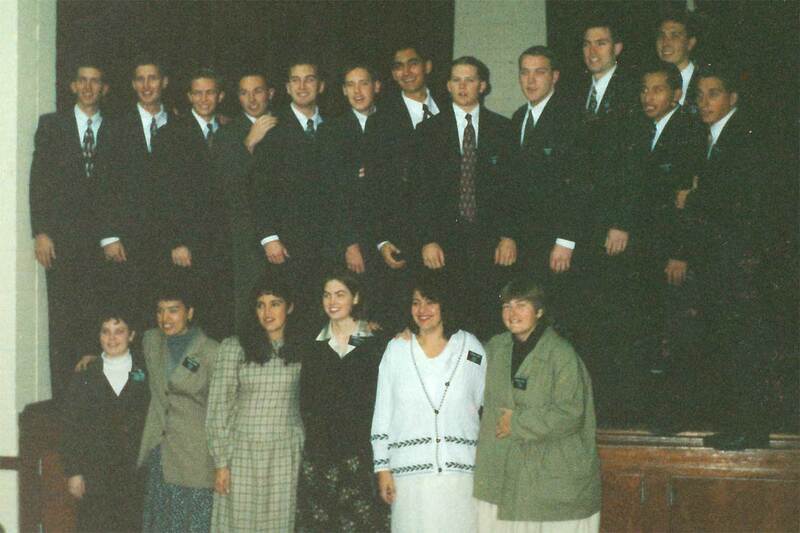 The other young lady in white was taught by Elder Call and Elder Guest who are in the far right of the picture. The date was May 25, 1997. 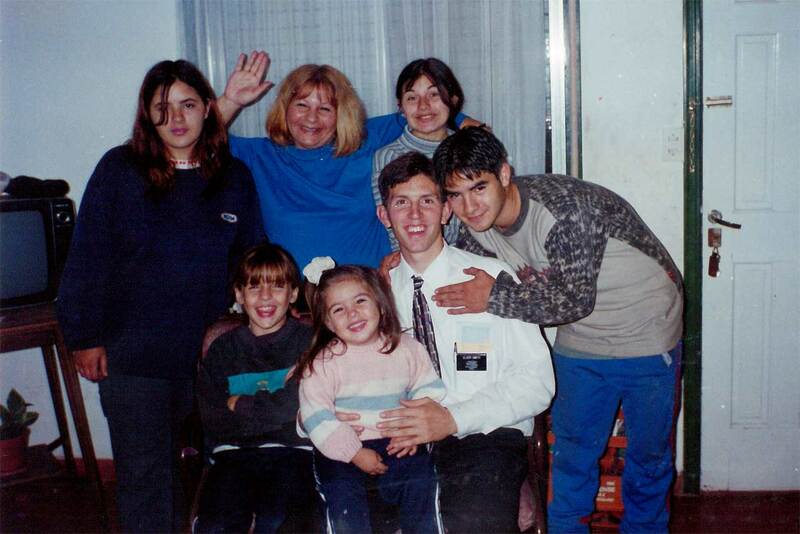 After the baptism of Jorge and Sandra Roma. When we found out that I was being transferred out of the ward, Juan Juarez, pictured here with me, set up a surprise going away party at German Arrieta’s house. German Arrieta, at the far right in the picture above, was sad that I was leaving. He was a good man and a good friend. 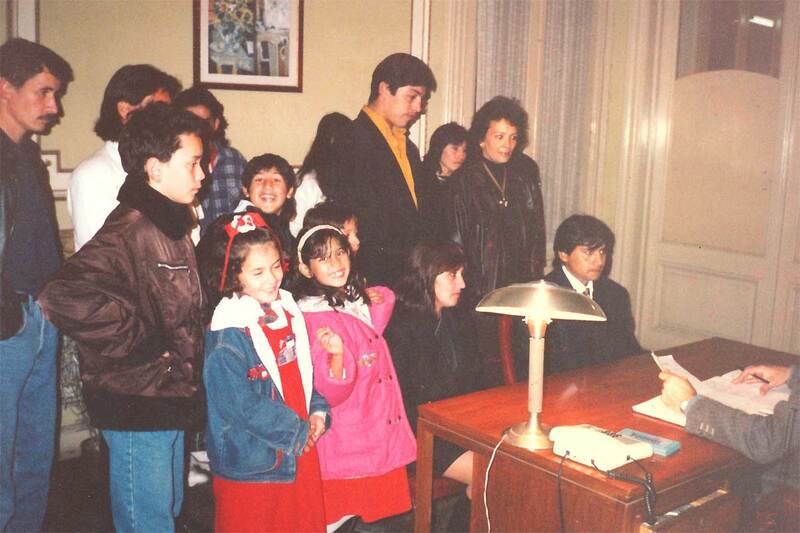 Also present in the picture are the Theodoroy, Gonzalez, Godoy, Marquez, and Pizarro families. Here’s another picture of the going away party. Elder Bray, Juan Juarez, and my first companion in the Godoy ward, Elder Loertscher. Juan was a recently returned missionary. When Elder Bray’s former companion, Elder Araya, received an emergency transfer, Juan became is companion for a couple of weeks. This is Elder Brown who replaced Elder Loertscher after we had been together for a month. This was taken when we still lived in one of the worst apartments of my mission. It was a one car garage with a make shift bathroom in the corner. We moved a couple weeks after this picture was taken. 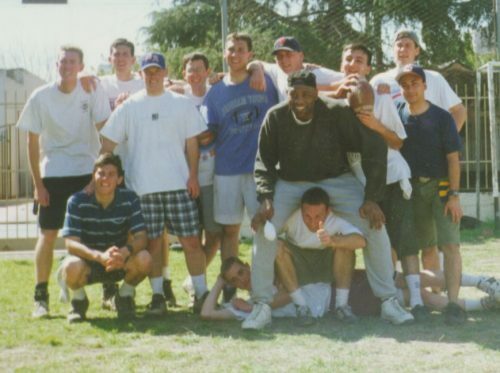 On this day, all the missionaries in our zone got together to eat lunch and play basketball. 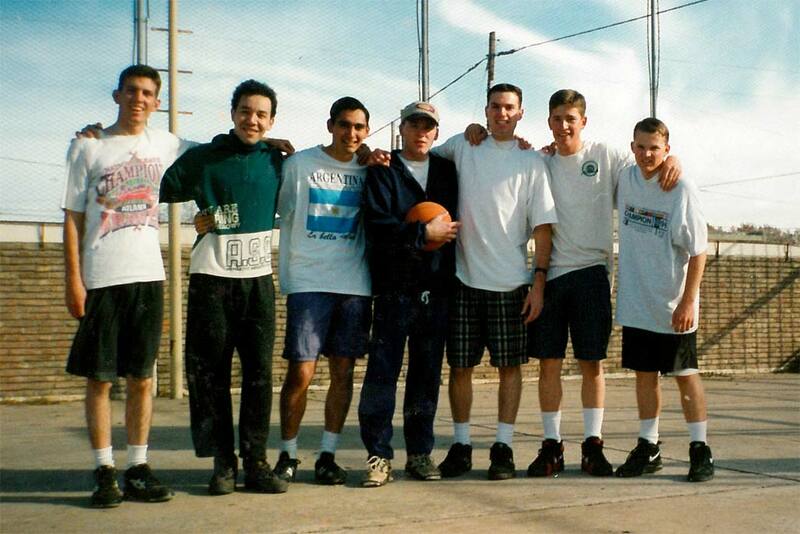 I love to play basketball, but didn’t get to play it a whole lot on my mission. Every once in a while, perhaps once a month, on a p-day, we would be able to make arrangements to play. This picture was the same zone activity as above. Here Elder Brown is sporting the present the Godoy family gave him for Friends Day, a River Plate hat (River Plate is one of the big futbol/soccer teams in Argentina). The Godoys gave me a tie for the occasion. Also in the picture is Juan Juarez, who needed a place to stay for a few nights. In our new apartment, we had an extra bed and we were so grateful for his help earlier, so we let him stay. This is the Rosario West Zone (which corresponded to the Rosario West Stake) at a zone conference. This is a get together of the missionaries of the Rosario West zone at the Argentina National Flag Monument. It was good to see my former companion Elder Sanchez there. 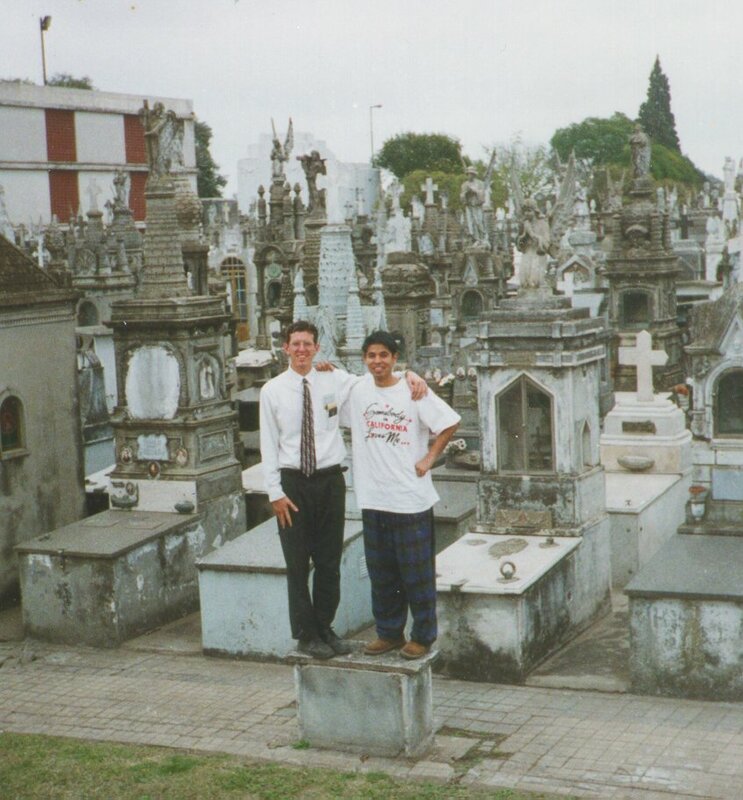 This is Juan Juarez and I at a Catholic Cemetary that was in our area. We always had to walk around it and it was quite large so I guess one day we decided if we could take a look inside. This is a photo I snapped near the Godoy’s house of a man selling fruits and vegetables from his house drawn cart. 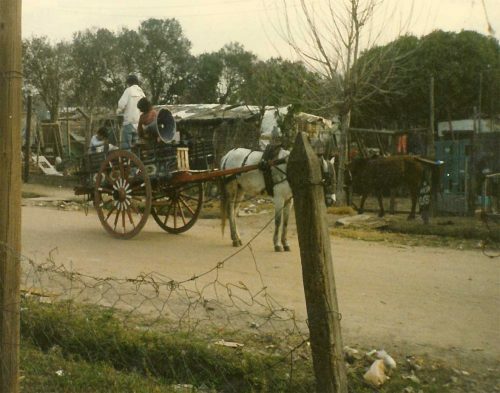 A common sight in Argentina. Every day we walked past this statue. It is of the newest Catholic Saint, Gauchito Gil, who is said to have performed some miracles during his life. We visited a Catholic Cathedral one day and snapped these two interesting pictures, or at least to us as Mormons it was really fascinating. 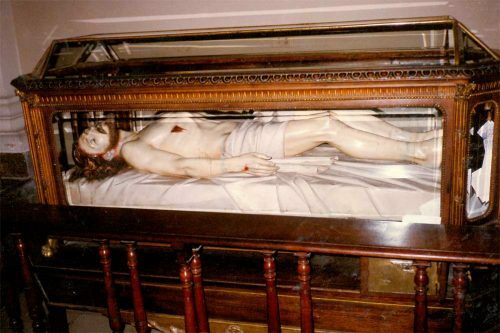 The one above is a shrine to the Virgin Mary and the one below is of course our slain Savior Jesus Christ before he resurrected. 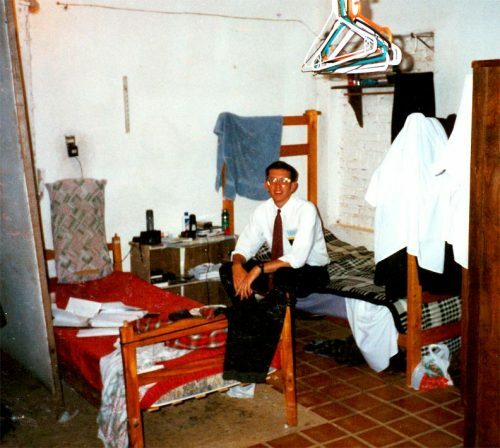 I arrived in the Godoy ward to find the missionaries living in this apartment that was no more than (loosely) converted garage. It was cold and damp and small. Living conditions in general were lower than what most North American missionaries were used to, but this apartment was pretty pathetic even compared to all the other apartments I had been in. 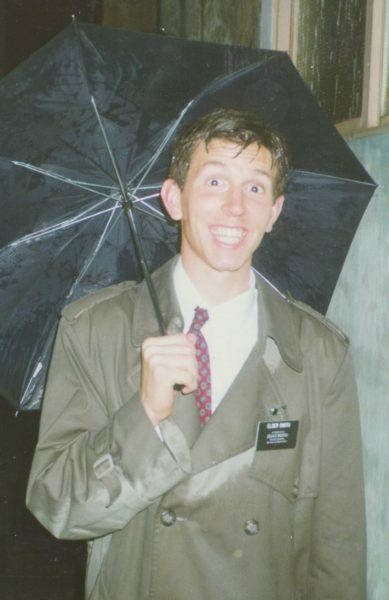 Elder Loertscher didn’t complain, though. But still, I talked to the mission president about it right away and began making plans to move. After my first month in the Godoy ward, we moved from that terrible garage apartment into the house of Walter Pizarro for a short time and then into this apartment pictured. Walter and Hedgars Gonzalez helped us move. 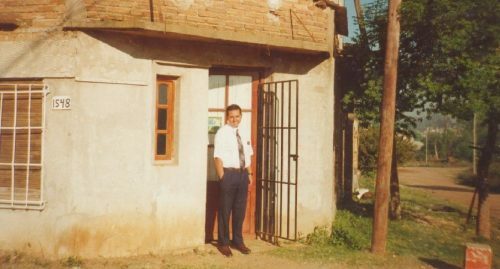 The owner of the home, Theodoro, lived in the front of the house, and we missionaries lived around back where there was a separate apartment with its own entrance. This new apartment was twice as big, had little kitchen, and better bathroom facilities. 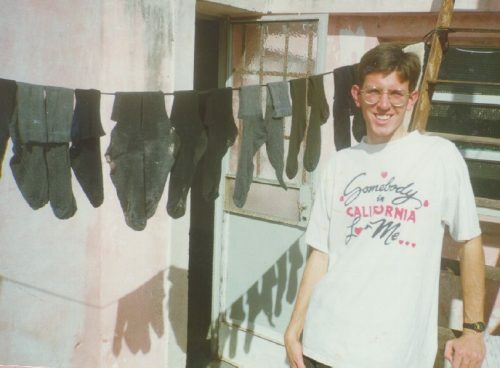 Elder Brown told me that he could tell I had been out on my mission for a long time because of all the holes in my socks. I thought it was a badge of honor for putting in all those long hours, day after day, walking the streets of Argentina, sharing the gospel of Jesus Christ. As many of you have already heard, last week, on October 20, 2017, the First Presidency of the Church put out a statement introducing a standard set of missionary interview questions. They asked that all priesthood leaders across the Church use these same standardized interview questions when meeting with young men and women who are prospective candidates to go on a mission. The First presidency asked that youth and their parents be made aware of these questions well in advance of the actual interview. Therefore, I am publishing them here to help get the word out. Click the following button to download a one-page PDF of the questions, or see the list of question in the body of this article below. 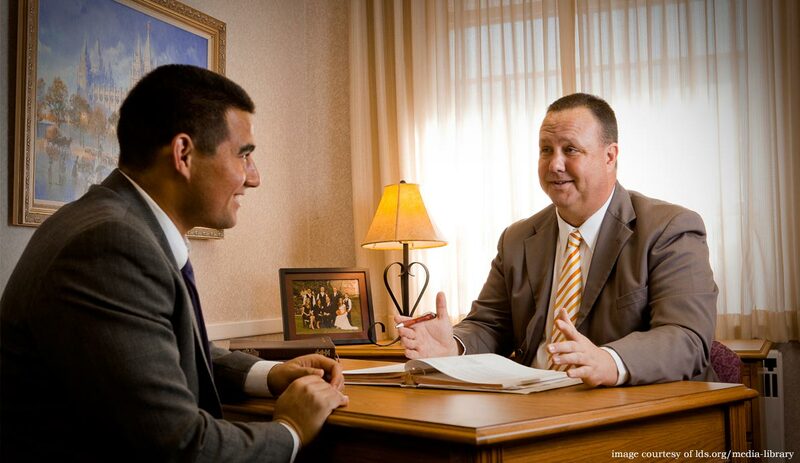 The supplemental material sent with the First Presidency letter sheds more light on why these standard interview questions have been established. They have been released as part of the LDS Church’s continued efforts to help future missionaries be better “spiritually, physically, mentally, and emotionally prepared for missionary service.” Missionary service is a major milestone in people’s spiritual growth and Church leaders want the mission to be a positive, “joyous and faith-building experience for every missionary.” In order to accomplish that, “it is imperative that each missionary be appropriately prepared, worthy, and healthy” and these questions will help do that by encouraging conversations between youth and leaders on a variety of important topics of mission prep. 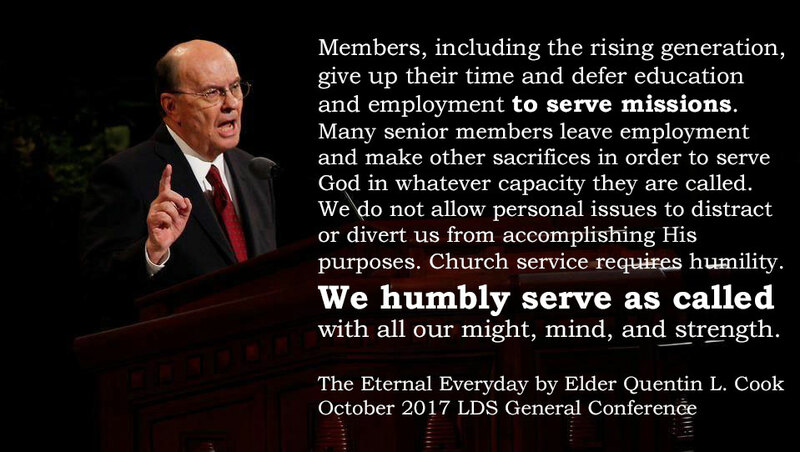 While “these questions do not represent any change in the standards for missionary service,” the Church is making a greater effort to help future missionaries and their parents better “understand the requirements for full-time missionary service.” These “questions are intended to guide” the pre-mission conversations between missionary candidates and their priesthood leaders (bishops and stake presidents) and help all parties know if the “missionary candidate may be unable to fulfill the requirements of a full-time mission” because of spiritual, physical, emotional, or mental health challenges. The supplemental material also dives into tithing, the word of wisdom, keeping the sabbath-day holy, and honesty, revealing that these are also topics that are likely stumbling blocks for many young people today. 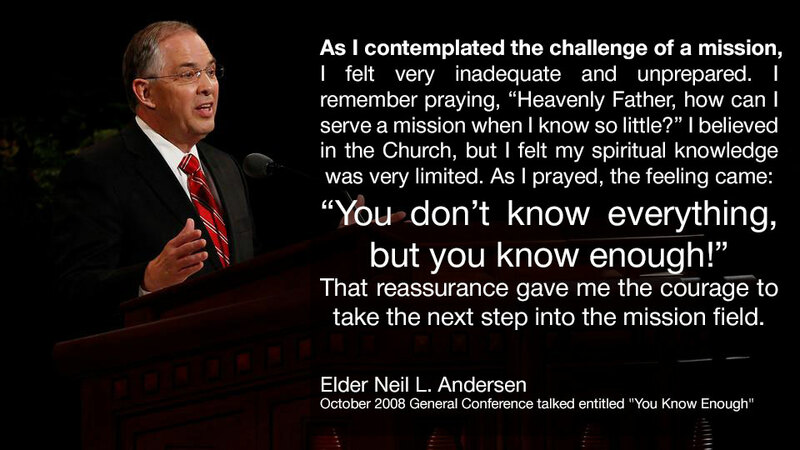 Why a different set of questions than for the temple? Another very interesting aspect of these questions is how they dive into the mental health issues of attention deficit hyperactivity disorder (ADHD), anxiety, depression, obsessive compulsive disorder (OCD), and autism spectrum disorder, including Asperger’s Syndrome. One of my sons has mental health issues along these lines, so my wife and I are very interested in the Church’s stance regarding his possibility of serving a full-time mission some day. 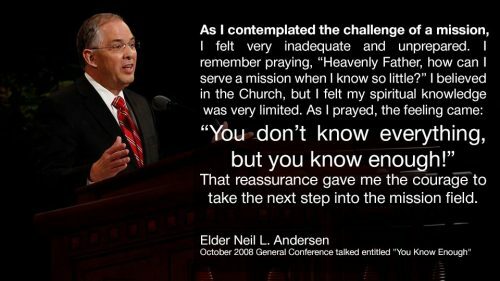 Will the Church let him go on a regular full-time mission while he is actively taking medication for his condition or will they require him to do a Church Service Mission? I wish there were more answers, but unfortunately, while the topic is brought up in the list of questions, the supplemental material gave few answers regarding what youth, parents, or priesthood leaders are to do about someone who has these conditions and functions well with the aid of prescription medications. Perhaps the Church’s policy is to handle those on a case by case basis and that’s why they don’t specify further. Do you have a testimony that Jesus Christ is the only begotten Son of God and the Savior and Redeemer of the world? Please share your testimony with me. How has the Atonement of Jesus Christ influenced your life? What does it mean to you to repent? Do you feel that you have fully repented of past transgressions? Will you share your testimony with me that the gospel and Church of Jesus Christ have been restored through the Prophet Joseph Smith and that [current Church President] is a prophet of God? Full-time missionary service requires living gospel standards. What do you understand about the following standards? a. The law of chastity In reference to the law of chastity, have you always lived in accordance with what has been discussed? If not, how long ago did the transgression(s) occur? What have you done to repent? Have you lived in accordance with all of these standards? Are you now living in accordance with them? 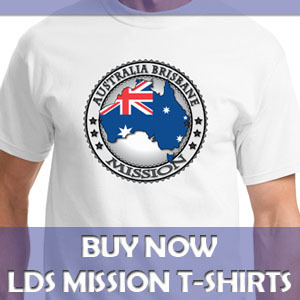 Will you live in accordance with them as a full-time missionary? Do you support, affiliate with, or agree with any group or individual whose teachings or practices are contrary to or oppose those accepted by The Church of Jesus Christ of Latter-day Saints? Do you currently have or have you ever had any physical, mental, or emotional condition that would make it difficult for you to maintain a normal missionary schedule, which requires that you work for 12–15 hours a day, including studying for 2–4 hours a day, walking or biking for up to 8–10 hours a day, and so forth? Have you ever been diagnosed with or received treatment for dyslexia or other reading disorder? If so, are you comfortable reading the scriptures and other documents aloud? Do you believe that you could memorize appropriate scriptures and other information with the assistance of your companion? In what ways do you now compensate for this disorder? Have you ever been diagnosed with or received treatment for a speech disorder? If so, are you comfortable speaking in front of others? Do you feel that you have adequate tools to help you learn, teach, and communicate? Have you ever been on medication or otherwise treated for any of the following conditions: attention deficit disorder (ADD), attention deficit hyperactivity disorder (ADHD), anxiety, depression, obsessive compulsive disorder (OCD), or autism spectrum disorder (including Asperger’s)? If yes, please explain. If you were being treated for one of these conditions and discontinued treatment, did you do so under a doctor’s supervision? If not, why did you stop? How well have you been functioning without treatment or medication? When was the last time you were on medication for these issues? I was asked to give a talk in church about the joy of service in relation to a recent trip I made to Houston, Texas with other members of our congregation to help in the cleanup effort in the aftermath of Hurricane Harvey. I thought the joy of service was a good topic for mission prep, so I’m sharing the talk here. Before talking about the Houston trip after Hurricane Harvey, let me take you back 12 years to the fall of 2005. My wife and I were living in Memphis, TN, and we had two small children. Hurricane Katrina had just hit New Orleans and other cities near there on the coast of the Gulf of Mexico. There was an announcement at church that our congregation was one of many throughout the south that was asked to send a team of workers to New Orleans for a weekend to help clean up. I was excited about the chance to go participate in the hurricane cleanup. The announcement struck me as a rare opportunity to do some great service, and I immediately volunteered. My only hesitation was leaving my wife at home for a long weekend alone with the children, but I knew I would have her support. I went with dozens of other men from LDS Church congregations in and around Memphis. 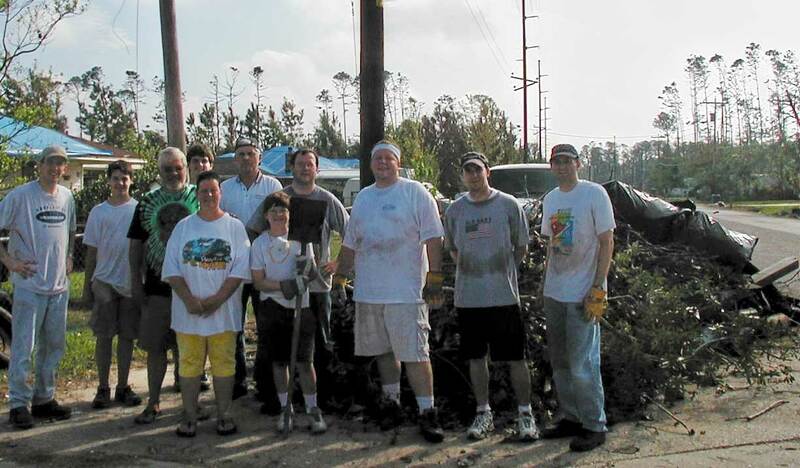 On that first of three trips I made to the Gulf coast for Hurricane Katrina relief, we mostly cleared brush, sawed up fallen trees, and hauled yard debris out to the street for many homeowners in the town of Waveland, Mississippi. About a month later, we were called on again, and again I went down to the Gulf coast, this time to the city of Slidell, Louisiana. 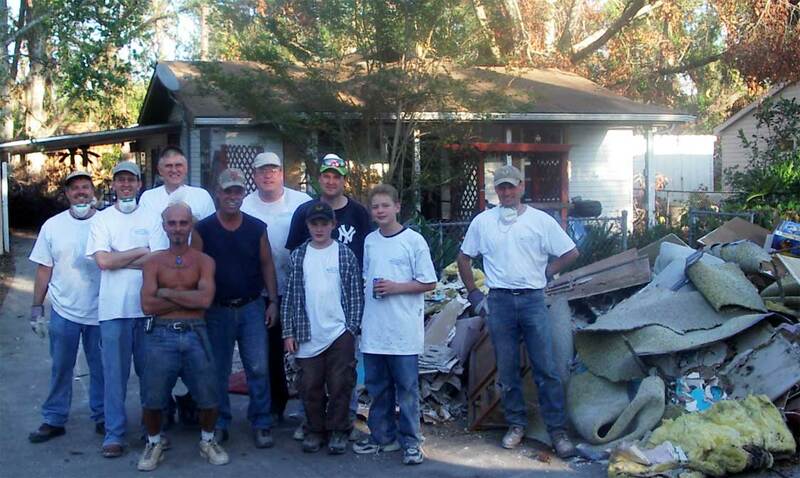 We spent the bulk of our time on this trip in mucking out a few homes. 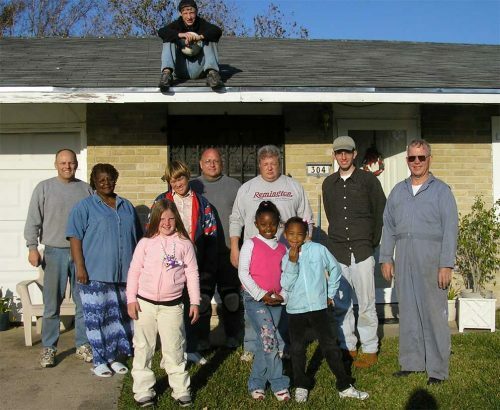 Then, about a year later, I went to the Gulf coast a third time for Hurricane Katrina relief efforts, and this time we were in the city of New Orleans, Louisiana, part of a crew that replaced the roof of a woman’s home. Each of us who went on these trips made many sacrifices of our time. We would leave around 6pm on a Friday night and make the six hour drive to New Orleans, arriving around midnight. We would sleep either in tents on an LDS Church property or in sleeping bags on the floor inside the church. We would work all day Saturday and the first half of the day Sunday. Then we would drive back to Memphis, arriving late Sunday night, so we could all go back to our regular jobs Monday morning. While it was hard work, it was also satisfying and enjoyable to help those in need. I also formed special bonds of friendship with the other men who went on the relief trips. The blessings went both ways, to the givers and receivers of the service, and I was glad I went on every one of those service weekends. 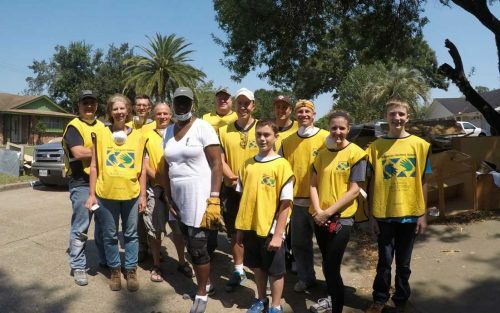 At the time I volunteered, I wasn’t sure if I would ever have the opportunity to participate in a massive service project like that again, so I wanted to take advantage of it. As it turns out, 12 years later I would have a very similar opportunity. A few months ago, Hurricane Harvey struck the Houston, Texas area, bringing wind damage and much flooding all along the Gulf coast in that region. Once again, the LDS Church sent out a call for volunteers, and once again, when I heard the request, I jumped at the chance to go and help. This time I was able to bring, Abe, my now 13-year-old son, with me on the relief trip. We got up very early on a Saturday morning in September and made the four-hour drive from the Dallas area to Houston. By mid-morning our crew, of about 12 men and women and youth were pulling up the wet and rotting floors of in a home owned by a couple named Barry and Jennifer. In the afternoon, we went across the street to pull wet sheet rock out of the house of a single woman named Beverly. That night, our team of workers were taken care of by some very nice members of the Church who fed us and gave us a comfortable place to sleep. We headed back out to work on Sunday morning after a church service with the sacrament, a couple of testimonies, and a stirring rendition of the hymn How Great Thou Art by a quartet of three women and one man. We did some more mucking and debris removal from the home of a woman named Carolyn, and then we drove back home to the Dallas area on Sunday afternoon. When I was asked to talk about the weekend in Houston and the joy of service, I pondered about what I could say. The thought occurred to me, and I think it was inspiration from the Spirit of God, that perhaps I should talk about what inspires me. What inspires me to drop everything in my life at short notice, drive hundreds of miles, and work all day in hot and dirty conditions to help people I have never met before? Honestly, my next thought was who wouldn’t want to go and do service projects like this. These were wonderful experiences. For me, there is nothing better than to truly help people who have a sincere need. “Learn in your youth the joy of service in the cause of the Master. …As we look heavenward, we inevitably learn of our responsibility to reach outward. To find real happiness, we must seek for it in a focus outside ourselves. No one has learned the meaning of living until he has surrendered his ego to the service of his fellow man. Service to others is akin to duty, the fulfillment of which brings true joy.”(The Joy of Service, New Era, Oct 2009). Sacrifice Brings Light. Christ’s Light Brings Hope and Happiness. There is one more thing I have felt inspired to mention regarding the blessings of serving others and that is a lesson that stems from the Savior’s story of the Widow’s Mite. With the estimated damage in the billions of dollars from these natural disasters that I talked about above, my relatively measly contribution to the cleanup and recovery would certainly equate to no more than a mite or two. But one of the points of the widow’s mite story is that God has a different way of measuring, compared to the rest of the world, when determining the value of our actions and contributions. While we often call this the story of the widow’s mite, I feel it might be better if we referred to the story as “the widow’s heart.” The point of the story isn’t the money, it’s that by giving all her money the widow demonstrated that she had given her whole heart and soul to God. The wealthy people may have put in a lot of gold and silver into the treasury, but that was not something of much value to God. God doesn’t need our gold and our silver, He can command the elements and create a planet full of gold and silver. What God values is our souls (see D&C 18:10 and Moses 1:39). And the widow, in giving all that she had, demonstrated that she was giving her entire heart and soul to God and that’s why Jesus said that she put in more than all the other rich people. Brothers and Sisters, I know that in our service to others is found the key to receiving joy and happiness. Our duties and our covenants compel us to give freely of our time and talents in the service of others (see Mosiah 18:9), and all the commandments and the whole gospel plan is designed to bring us the greatest joy possible (see D&C 14:7). In John 15:10-11 Jesus explained that this is why he has given us the commandments to love and serve each other: “If ye keep my commandments, ye shall abide in my love; even as I have kept my Father’s commandments, and abide in his love. These things have I spoken unto you, that my joy might remain in you, and that your joy might be full.” I know these things are true. 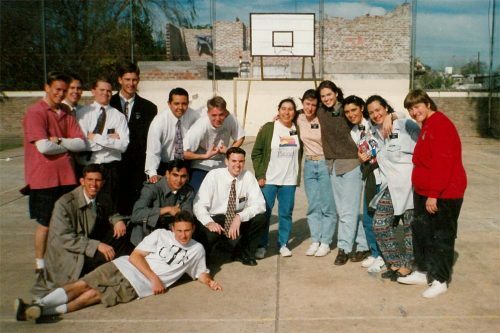 I served as a missionary in the Universidad Branch of the LDS Church in the city of Concordia, Argentina from February 19, 1997 to April 22, 1997. Here is a brief summary of my service in that area. 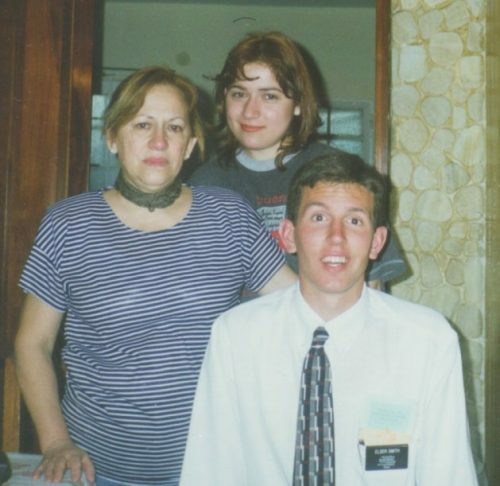 Also please visit this summary page about my mission to Argentina which includes the conversion stories of people I baptized and a summary report of each of the areas or wards in which I served. Four days after I arrived in the city of Condordia to serve in the Universidad Branch, we had the baptism of Maria Grillé on Feb 23, 1997. 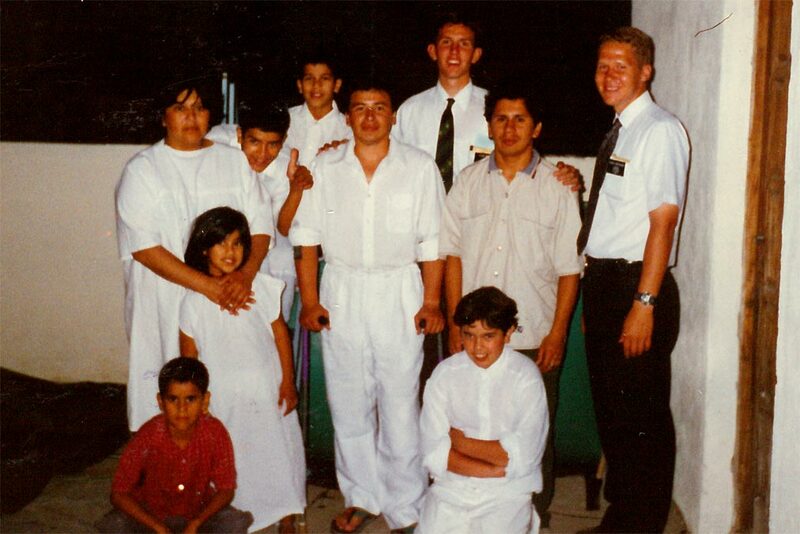 In the photo is me on the far left, then the brother performing the baptism is Ramón Dartuquí, then Maria, and then my companion, Elder Sanchez. I don’t remember much about Maria because she had already been taught all the missionary discussions before I arrived. But I do remember visiting her modest home a few times and the fact that she was part of a large family. Here is Maria Grillé surrounded by much of her family on the day of her baptism. The baptism was held at an LDS Church owned building in the city, but that was not where the Universidad Brand met. 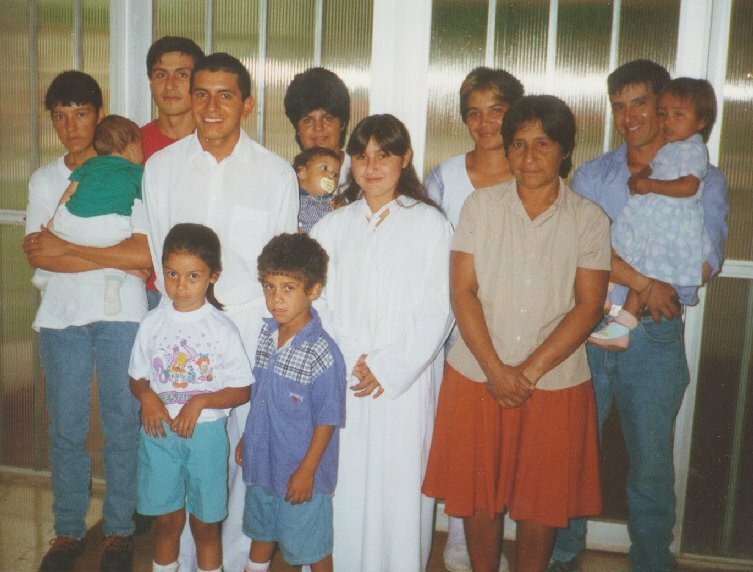 In the picture are Maria’s mom Dolores, who was baptized two weeks earlier, her brothers, sisters-in-law, nieces, and nephews. 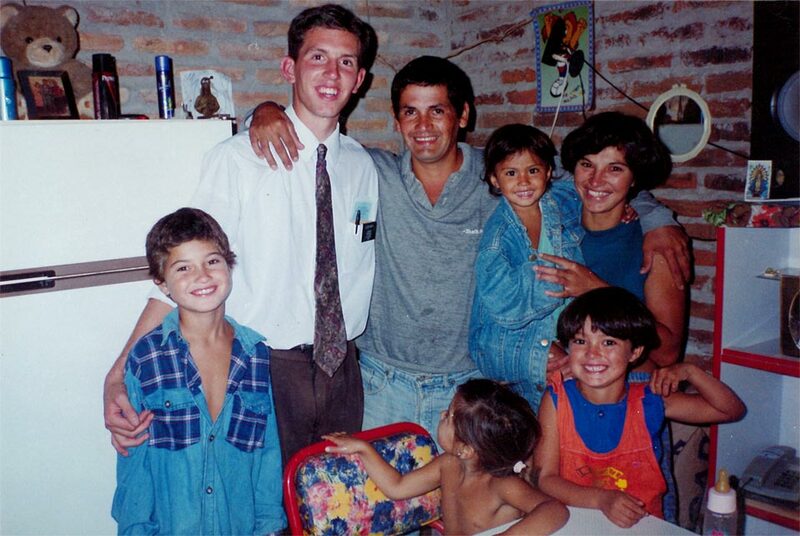 Here is the wonderful Lescano Family who I have previously written about and the miraculous way God guided us to them. I wish I had written down their names. I know Jorge is the father and Beatriz is the mother, and I think the son is Jorge Jr. but I do’t remember the names of the daughters in the family. They were such a darling family. I still remember the discussions we had around their dining room table. I was transferred after only two months in the city of Concordia and it just a week or two prior to the bastism of the Lescano family. My companion while I was in Concordia, Elder Sanchez, gave me this photo of their baptism. When I told Jorge Lescano that I was being transferred he got a little emotional. I too was sad to be leaving and not see their baptism. I was surprised when Jorge pulled out a photo album and gave me a picture of he and his wife Beatriz on their wedding day. He said he wanted me to keep it as a “recuerdo” (memento) and he even wrote his name and phone number on the back of the photo. I certainly will always remember him and his family. 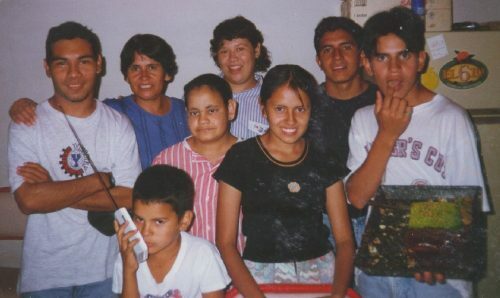 This is the Dartuquí family along with a couple of their friends. The Universidad branch was rather small so there weren’t a lot of families to feed the missionaries. But not to worry, the Dartuquí family stepped us and fed us lunch three times a week. I’m sure it was a sacrifice for them and I’m sure the Lord blessed them for it. If my memory serves me, the people in the photo are, left to right, Celestino, Sister Dartuquí, Esteban, Maria, Claudia, Sandra, Ramón, and Miguel. 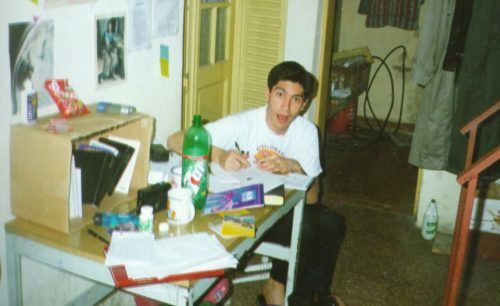 This picture was taken at the building that was rented for the Universidad Branch to meet in. The occasion was a branch Famil Home Evening activity. 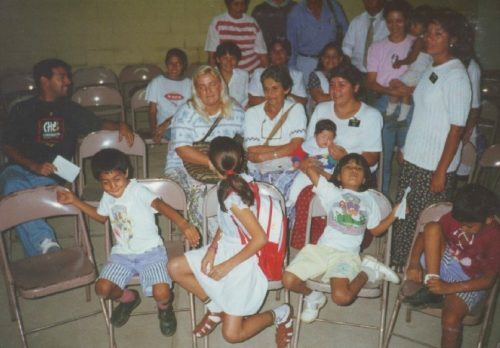 Pictured left to right are: an unknown baby, Elder Sanchez, myself, Esteban Dartuquí, the Sister Missionaries Jara and Salva, and Sister Dartuquí. And here’s another picture from that same Family Home Evening activity. 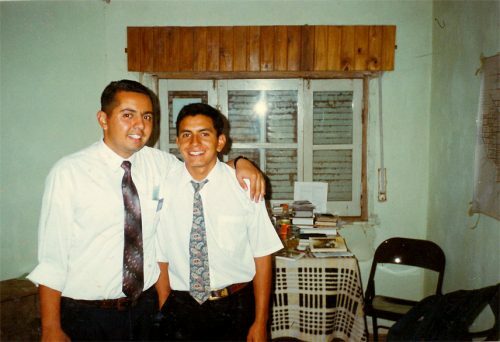 Here is my companion, Elder Sanchez, with Ramón Dartuquí. He must have come with us to an appointment. Or perhaps we were doing exchanges with the members. They are standing in our apartment in front of our study area. This picture was taken on one of my first day in the city of Concordia. This is my companion, Elder Sanchez, standing outside of our apartment. 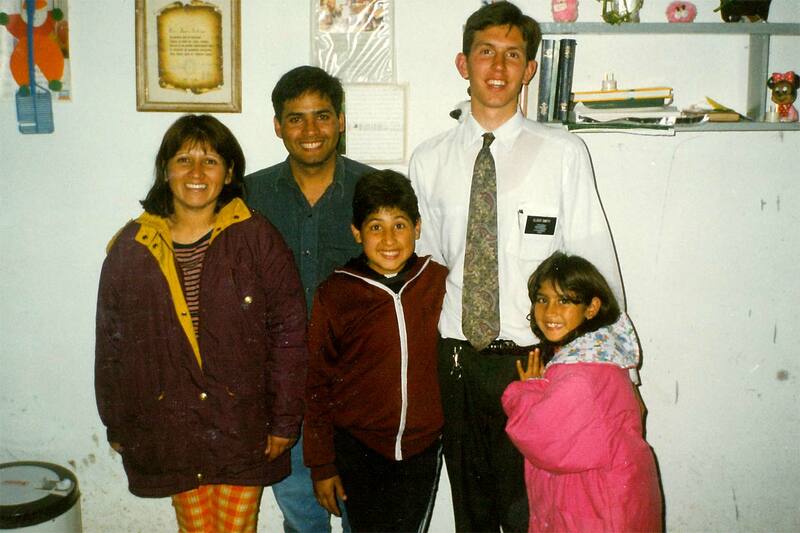 Elder Sanchez was a great missionary and I wish I could have been with him longer. 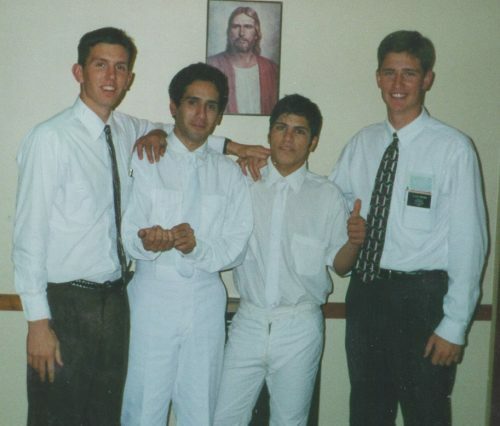 Though Elder Sanchez got to this branch first, and you would have expected him to be transferred out first, it was actually me who got transferred out first, after only two months together. Here is a guy selling buckets, mops, and other household cleaning supplies. He simply walks down the street and shouts out what he is selling and people that are interested stop him to buy what they need. I thought it was an interesting aspect of Argentine culture, so I snapped a photo. Here I am in our “pench” (short for pension which is Spanish for apartment). Mine is the first bed. I don’t remember being so sloppy and unorganized, and I apologize for not cleaning up a little before snapping this photo. Perhaps the picture was impromptu. “I Have a Work for Thee” by Elder John C. Pingree Jr.
“There came a time, early in my mission, when I knew that I had to know whether the Church was true and Joseph Smith was a prophet of God. …I knew what was necessary. I needed to read the Book of Mormon with a sincere heart, with real intent, and ask God whether it is true….I started at the beginning of the book and read every day. Some receive a witness very quickly. For others, it will take more time and more prayer and may include reading the book several times. I needed to read the entire book before I received the promised witness. However, God did manifest the truth of it unto me by the power of the Holy Ghost. “Please remember there is no blessing anyone can share greater than the message of the Restoration, which, when received and lived, promises everlasting joy and peace—even eternal life. Let us use our energy, strength, and testimonies in assisting our missionaries to find, teach, and baptize God’s children so they may have the power of the gospel doctrine guiding their daily lives. 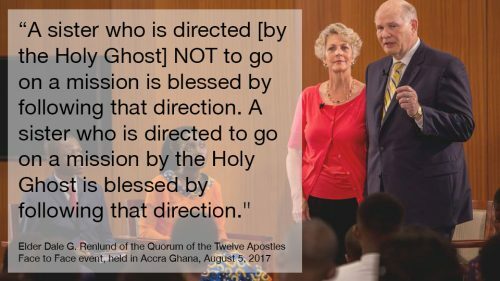 Summary: Elder Renlund says young women who follow the promptings of the Holy Ghost NOT to serve a full-time mission will be blessed as just much as those who follow the inspiration to serve. In a Face to Face event, held in August 2017 from Accra Ghana, Elder Dale G. Renlund of the Quorum of the Twelve Apostles and his wife, Sister Ruth L. Renlund, spoke to the youth of the Church for about an hour. While listening to an apostle of the Lord Jesus Christ speak is always good mission prep, there was one question that was particularly relevant to young women considering serving a full-time mission. Joy from Nigeria asked this question: Will blessings from Heavenly Father be denied to young women if they choose not to serve a full-time mission? Sister Renlund first spoke up and explained that young women are invited to serve full-time missions if they feel prompted by the Spirit of God. Young men, she said, are under an obligation to serve because it is part of the priesthood they have received. Because the priesthood carries the duty to preach the gospel to all the world, young men accept this responsibility to serve a full-time mission when they accepted the priesthood. 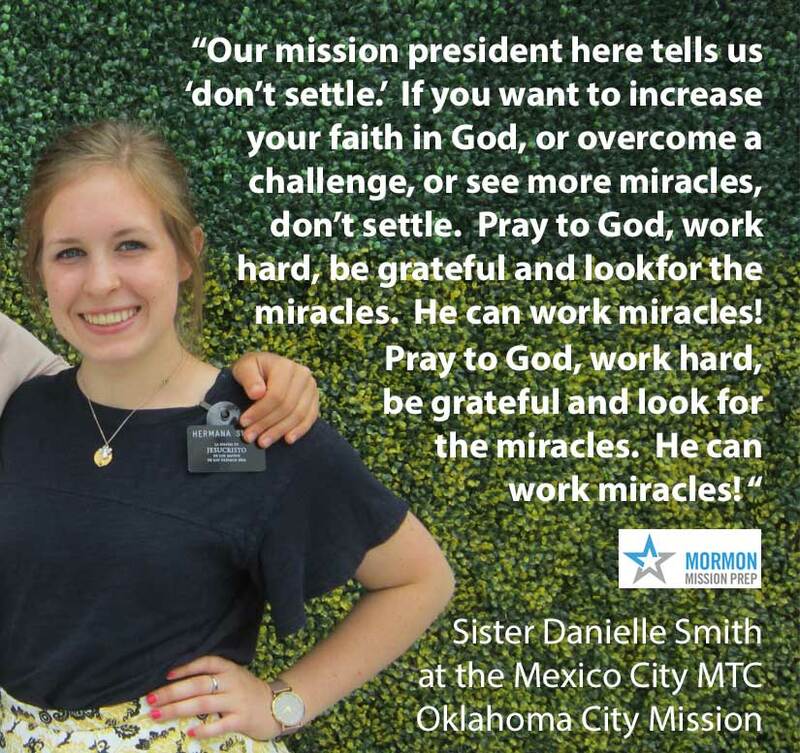 Young women are invited to participate as sister missionaries when prompted by the Holy Ghost. I’m glad Elder Renlund pointed out that young women who follow the promptings of the Spirit of God not to serve a mission will be blessed just as much as those who follow the spiritual promptings to serve. The key to being blessed, I think he points out well, is to follow the inspiration of the Spirit of God, wherever it leads you. My niece began her mission recently and we have been getting weekly emails from her. Seems to be really enjoying her time in the MTC in Mexico City. She was called the Oklahoma City Mission and was assigned to labor speaking in the Spanish language. A couple of weeks ago she sent an email with the following encouraging words. After reading it, I thought to myself that I need to increase my faith so I can see more miracles of God in my life. My family moved from Maryland to Georgia the summer of 1984 when I was seven years old. We lived out in the country, many miles from any city, about half way between the towns of Dahlonega and Dawsonville, in the mountain of northern Georgia. There were not a lot of members of the Church in this area, in fact there was no LDS Church ward, though there was a small branch. Close to half of the members of the branch were relatives of mine on my mother’s side. For meeting facilities, the church rented a warehouse in the area, and because it wasn’t an LDS Church building, it had no baptismal font. A couple of months after we moved there, I turned 8, and in early October, on a Sunday afternoon we headed to the LDS Church building in Gainesville, GA, which did have a font, for the baptismal service. 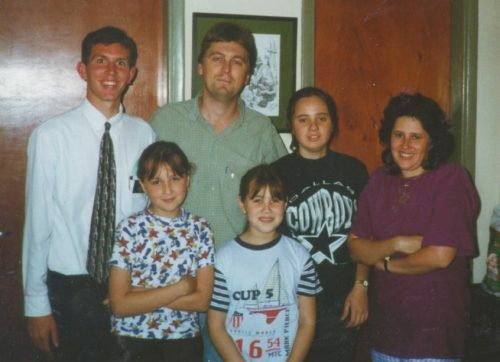 There were two other children from our branch that were baptized with me that day. “I baptize thee, having authority from the Almighty God, as a testimony that ye have entered into a covenant to serve him until you are dead as to the mortal body; and may the Spirit of the Lord be poured out upon you; and may he grant unto you eternal life, through the redemption of Christ, whom he has prepared from the foundation of the world. 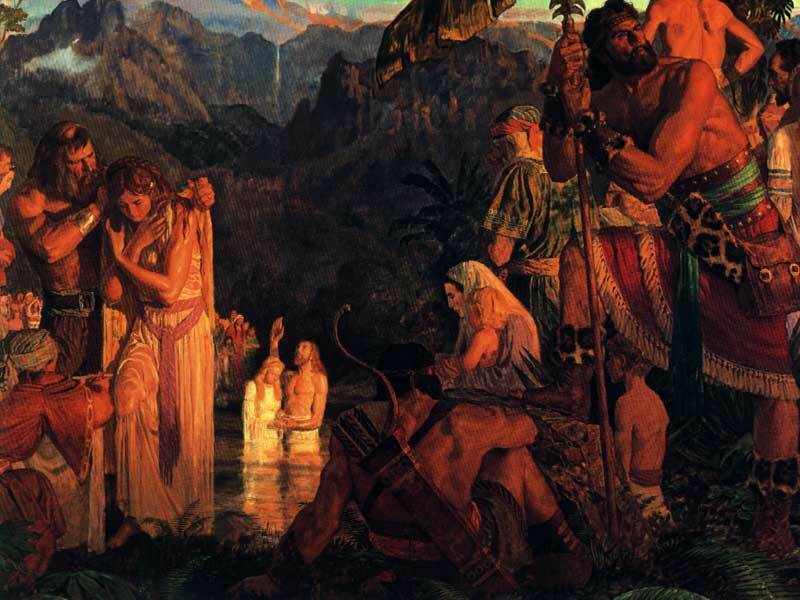 And after Alma had said these words, both Alma and Helam were buried in the water; and they arose and came forth out of the water rejoicing, being filled with the Spirit.” (Mosiah 18:13-14). After the baptism, my dad laid his hands on my head and bestowed the Gift of the Holy Ghost. The great blessings of that gift were not immediately apparent to me, but slowly, over the years, I have gained more and more appreciation for the gift of the constant companionship of the third member of the Godhead. 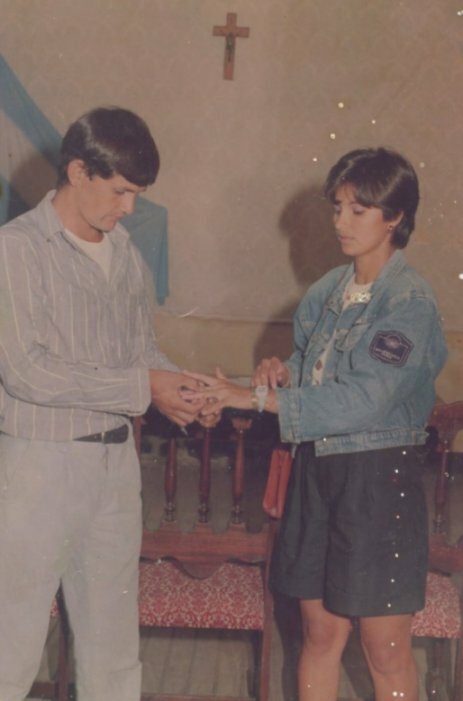 Still, at the time my dad confirmed me a member of the Church, I felt great joy, in fact, I could not stop smiling for many minutes after the ordinance of the laying on of hands. 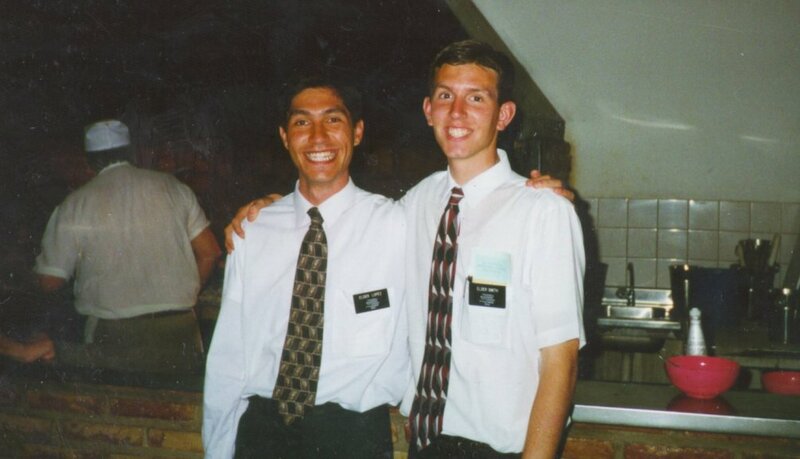 My dad used this moment as a teaching opportunity, and taught me that the joy I felt was from the Spirit of God and was a testament that I had made the right choice to be baptized and to commit my life to serving Christ. I have always remembered how happy I felt at that moment, and the lessons taught me by my father and confirmed by the Holy Spirit when I received those saving ordinances of baptism and the laying on of hands for the gift of the Holy Ghost. I thought I would make a Mormon Mission Prep version of the list which would focus on spiritual and physical preparation items that youth should achieve in preparing themselves to live independently and serve as full-time missionaries for the Lord. 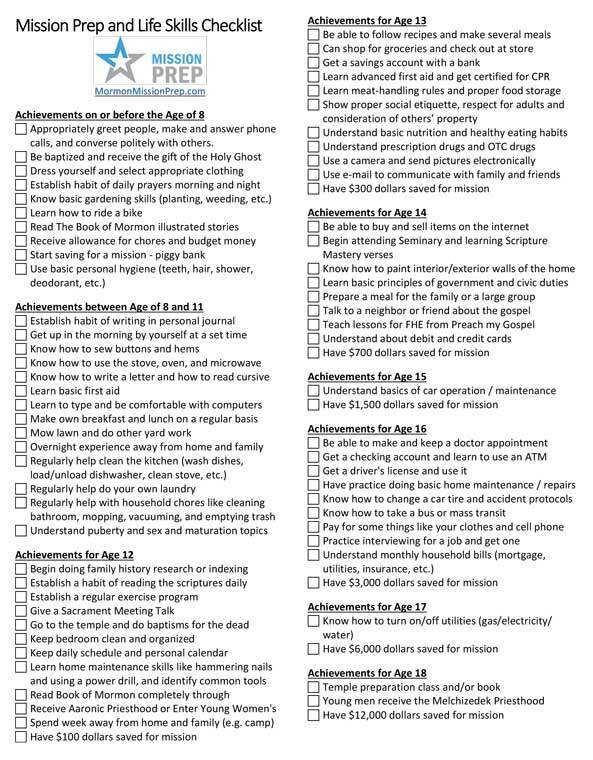 I didn’t want to replicate Raising Independent Children checklist, but rather have something unique to mission prep. I wanted it to be brief, one-page, list, focusing on the most important physical and spiritual skills young missionaries will need. I ended up 77 items in eight categories: Church Programs, Finances, Food Prep Skills, Household Chores and Maintenance, Personal Development, Spiritual Progress, Tech Savvy, and Transportation. Putting this list together was a great exercise because it made me realize we are behind, a little, with my son. But it has given us many ideas of things we need to work on with him now and in the coming years to make sure he is physically and spiritually prepared to serve his mission. I know this will help us, and hopefully it will help many other parents and youth as well. You may want to add, delete, or edit items on this list to meet you particular family needs, and that would be fine with me. Let me tell you a little about why I put the things I did in each category. Church Programs: In this category, you’ll find check points for progress in the LDS Church’s official programs such as Faith in God Award, Duty to God, Young Women’s (Personal Progress), Aaronic Priesthood, and Boy Scouts. These programs are inspired by God and have been instituted by our Church leaders to help the youth develop spiritual skills and Christ-like qualities. Finances: This section lists items necessary to help youth gain an understanding of money and how to use it responsibly such as earning an allowance for chores and learning to budget. It also includes more advanced topics like understand about debit and credit cards, and having youth begin to pay for some of their own things like clothes and cell phone when they get old enough. It also lists benchmark points for saving money for the mission. On that topic, I spaced it out so that youth double their mission savings each year. If they start at $150 at age 12 and double their mission savings each year, they will have the required $9,600 by the time they are 18. Food Prep Skills: A missionary who doesn’t know how to cook could find himself/herself very hungry very often. Therefore I created this category to help youth learn to cook for themselves and do so in a healthy way. An anxious mother of a prospective missionary once asked President Thomas S. Monson what he would recommend her son learn before the arrival of his missionary call. His answer: “Teach your son how to cook” (Who Honors God, God Honors). Household Chores and Maintenance: Missionaries often live in their own apartment and will need to understand basic home maintenance. 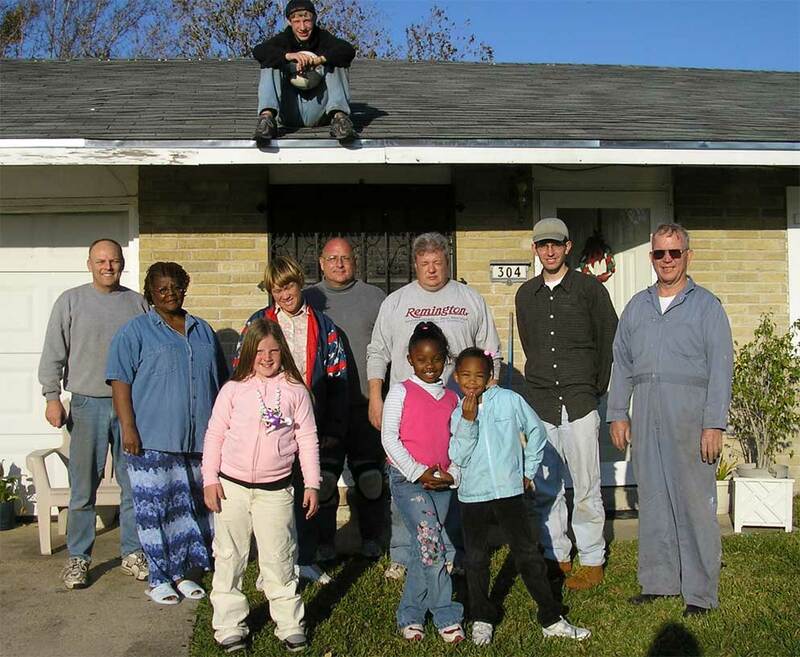 They also often do acts of service at other people’s homes that require knowledge and ability to do home maintenance. And of course, they will need to keep their room and apartment clean and tidy. Having these skills will help youth be more clean and orderly and be able to be more self-sufficient with chores around their apartment. Personal Development: This is the largest category because I have included many life skills and skills for hygiene, manners, and living independently. Also included in this category are some benchmarks for emotional strength that will be necessary for young missionaries to live away from home for an extended period without mom and dad around. Also included here are some skills for being able to take care of themselves and others by knowing first aid and CPR and about medical drug use, and making appointments with doctors. Spiritual Progress: While everything on the list is important, I believe this is the most important category. It is the things youth need to do to spiritually prepare themselves to be missionaries. These items will help young people develop their own testimonies of Jesus Christ, the scriptures, living prophets, and the restored gospel. Doing these things will help bring the Spirit of God in greater measure to the lives of the youth and will help them know how to teach by the power of the Spirit. Many of these items are not one time things, but habits that should be established like daily prayer and scripture study. 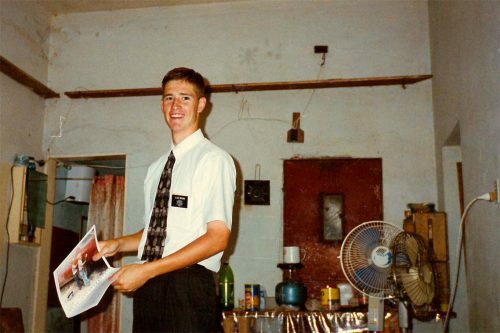 I have also listed things like teaching lessons, giving talks, and talking to neighbors about the gospel to give youth practice being missionaries. Tech Savvy: Having technical skills is important for life and is growing in importance in doing missionary work. Here I have listed just a few important skills such as using a computer and digital camera and email, all of which they’ll need to know how to do to write home to the family each week. Transportation: Missionaries do a lot of traveling via bikes, cars, buses, trains, and airplanes. Knowing how to get yourself around is an important skill for missionaries so I’ve included some of those things in the list. These are also important life skills, so it’s good for youth to have practice while they’re still at home. *My wonderful wife Heather made her own edition of the Raising Independent Children list. Download it below. There you will see all the original items from Merrilee Boyack’s list, plus a few things Heather added for our family. I think it is a great addition to the mission prep checklist with more detailed things for children to learn to do to help make them strong and well adjusted and ready to take on the world.